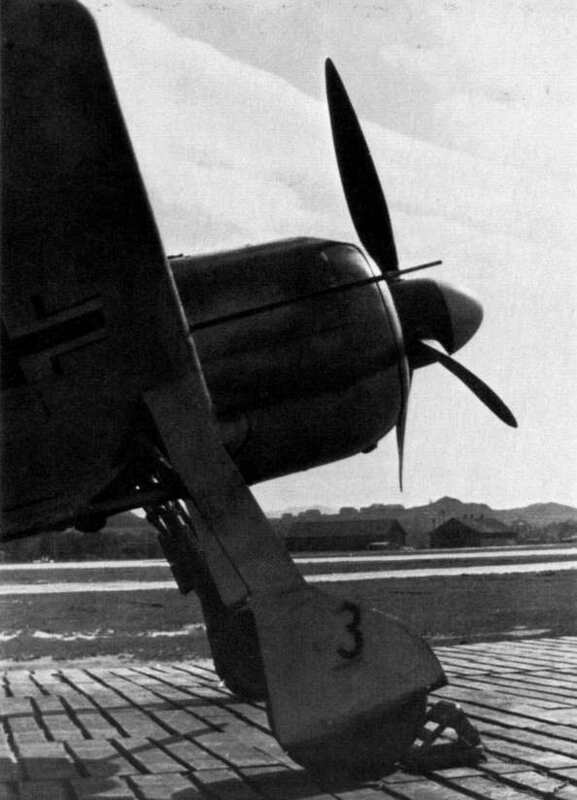 A good close-up view of the nose of a FW 190A-4 showing to advantage the 2 x 20 mm MG 151 cannons in the wing roots, the paddle bladed propeller and the fan behind the propeller which compressed the air flowing over the radial BMW 801D engine. 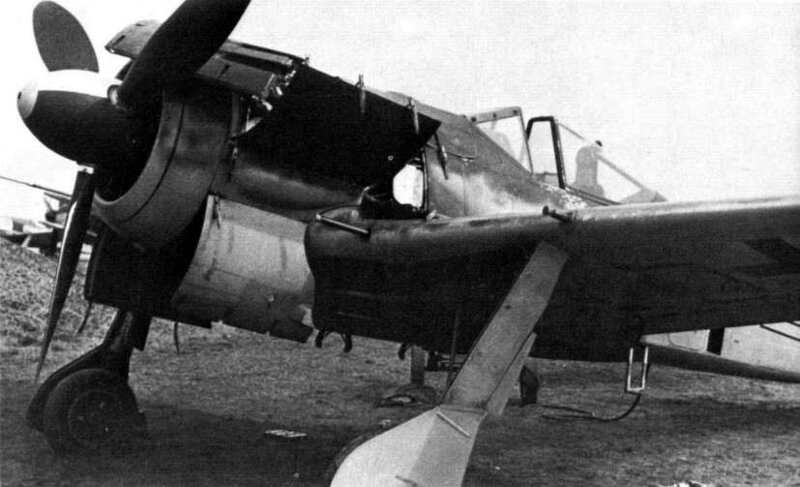 A FW 190A-5 with fuselage bomb shackles and open engine access panels. 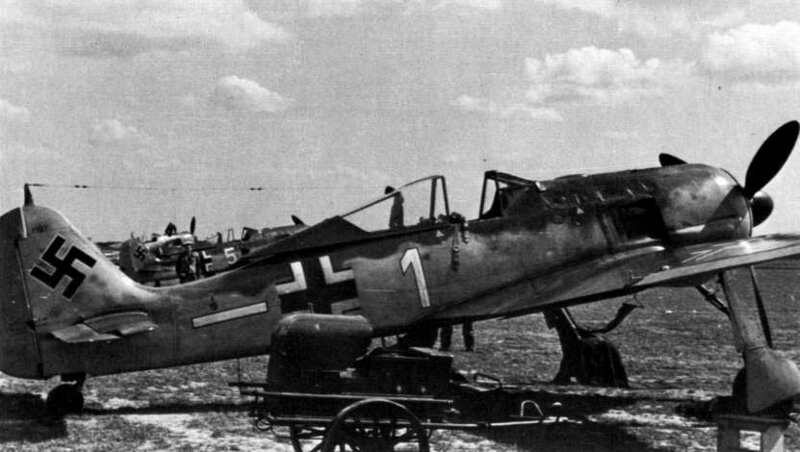 A FW 190A-5/U-8 with under wing drop tanks and a 500 lb. 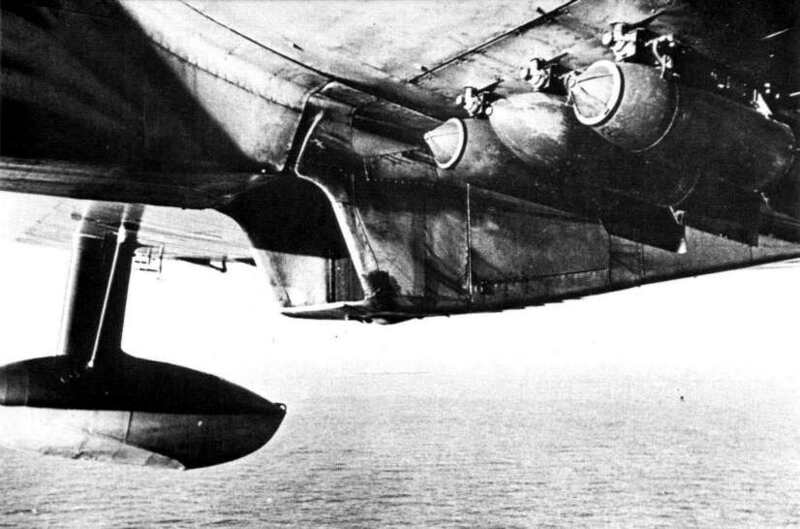 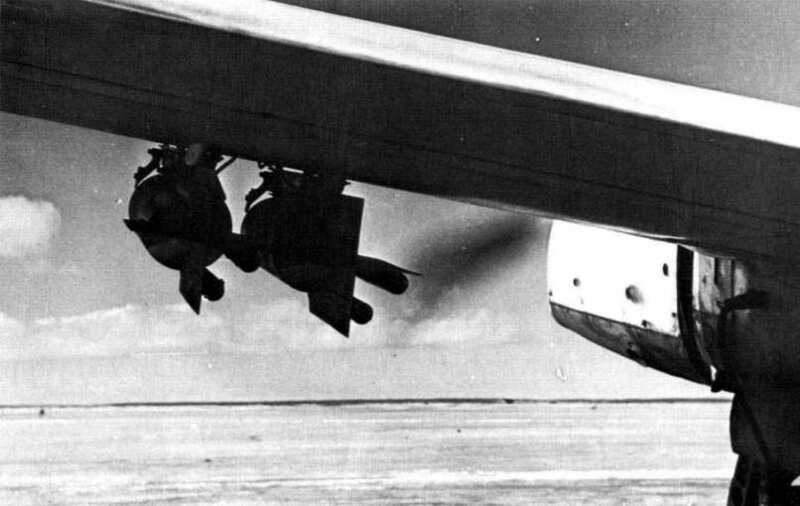 bomb mounted on the fuselage bomb rack. In this view, the engine is being put back together. 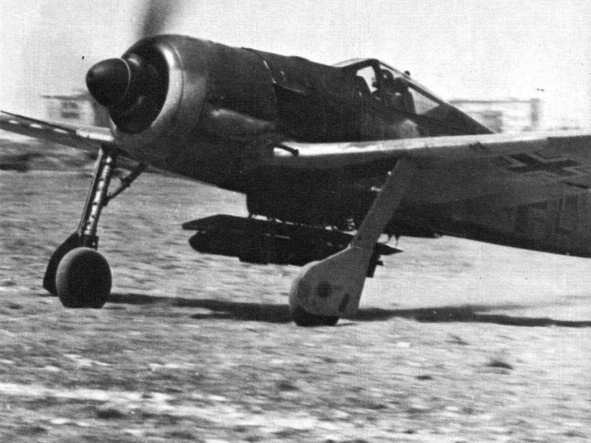 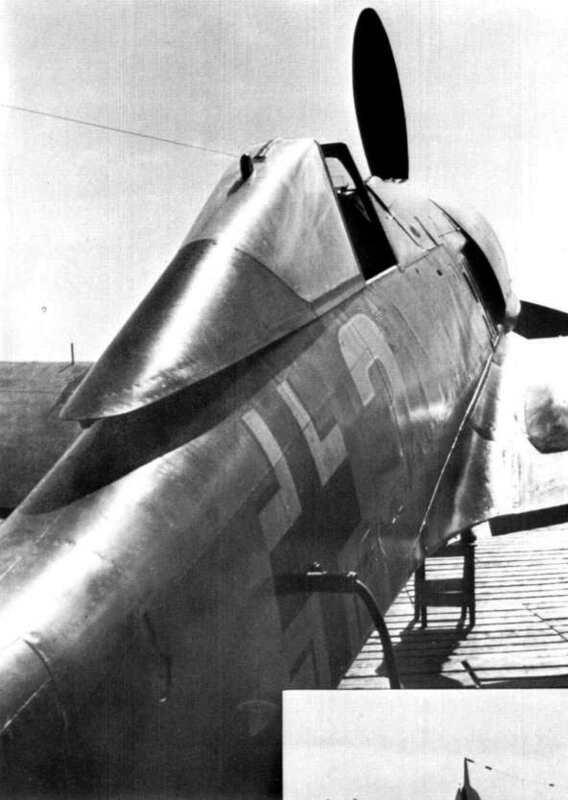 Note the lack of outer wing guns, which means that this is a FW 190A-6. 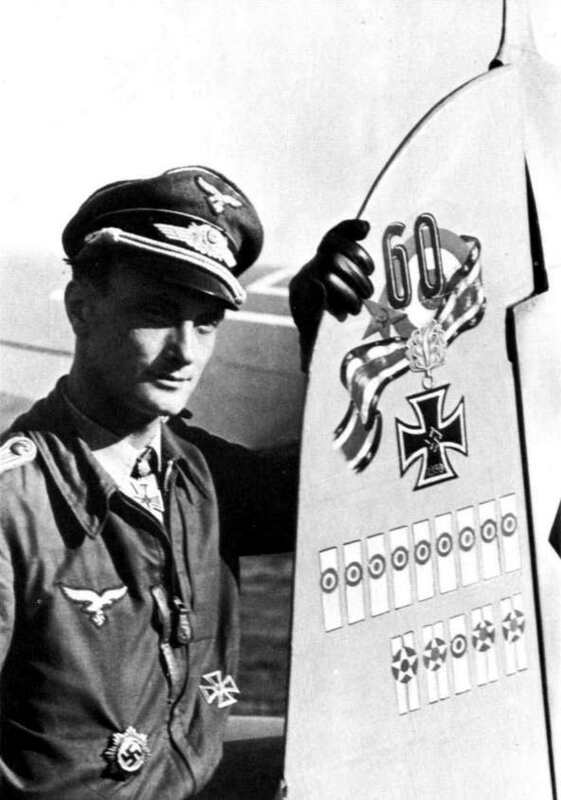 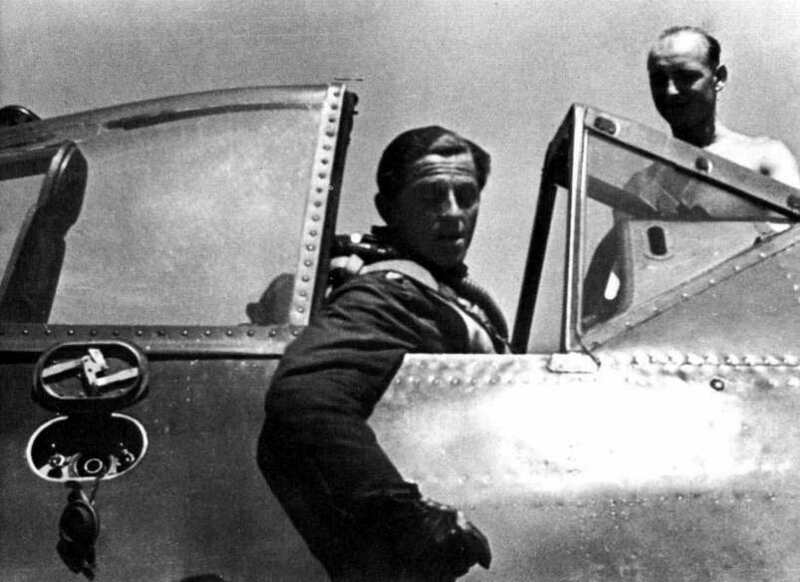 One of the premier FW 190 pilots, Lt. Sepp Wurmheller of JG 2, shot down by P-47s. 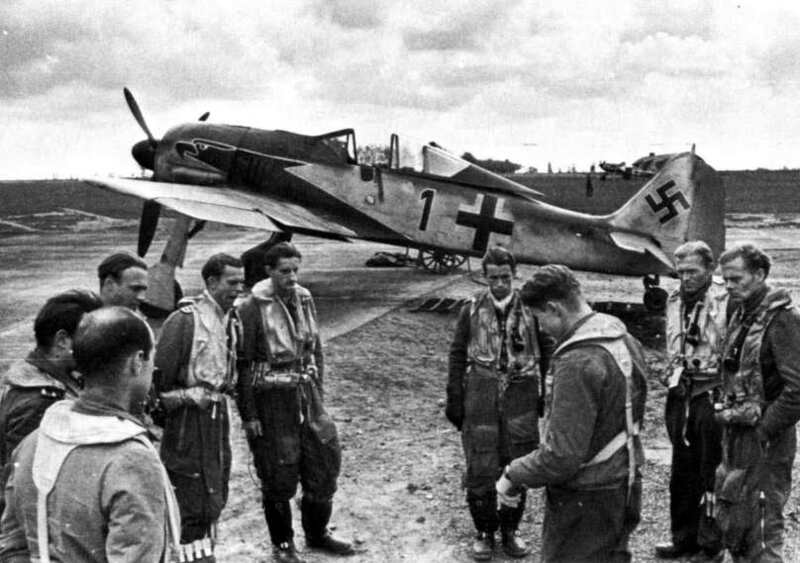 Pilots of JG 2 gather around Lt. Wurmheller (fourth from left) to hear about his 81st kill. 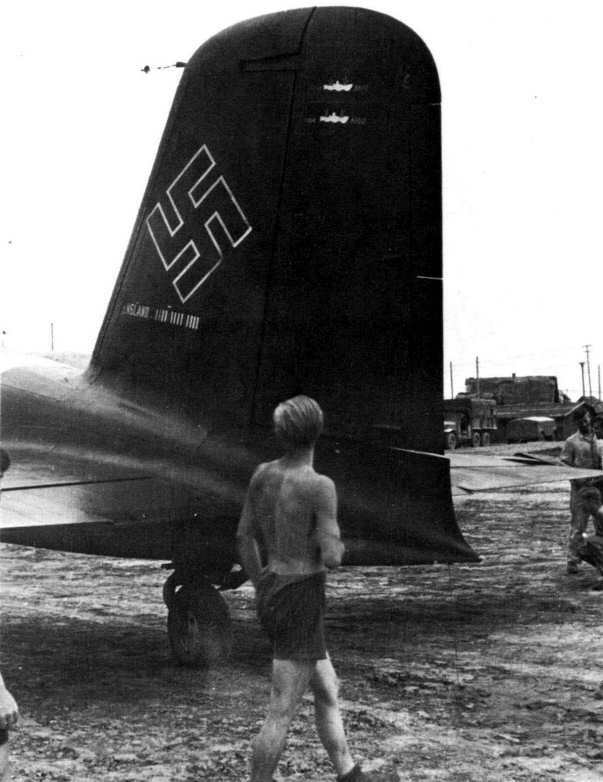 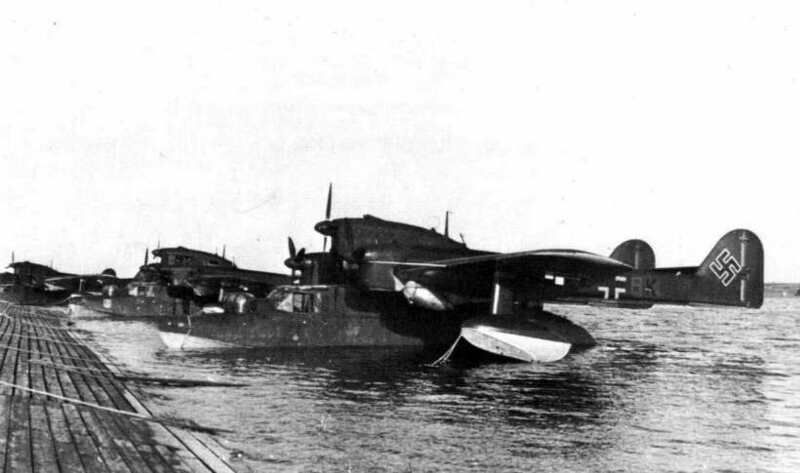 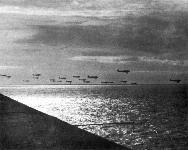 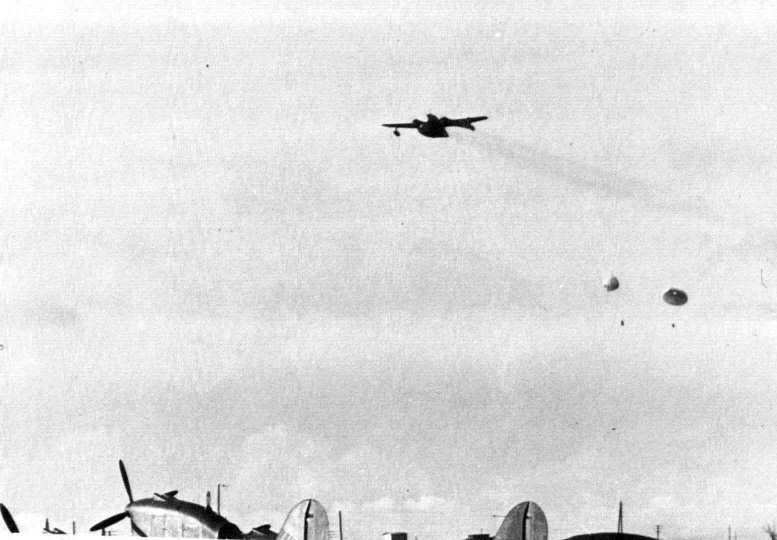 His aircraft, yellow 2, in the background, shows 80 kills on the rudder. 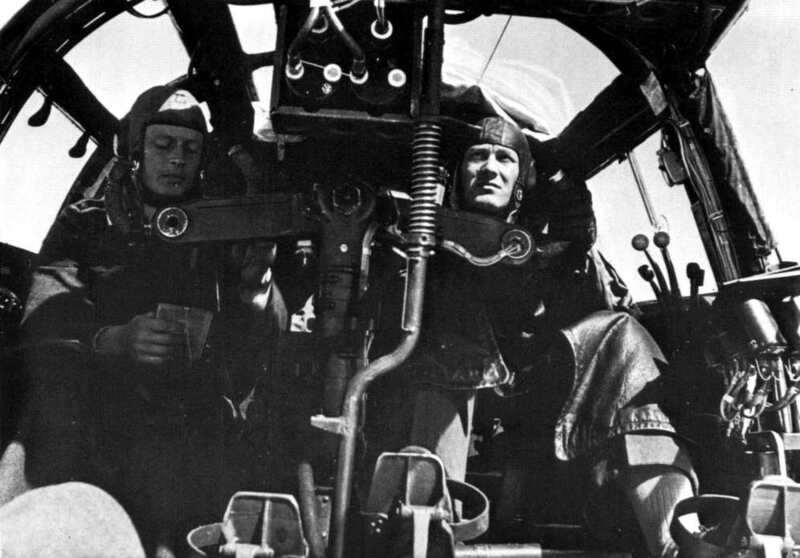 Pilots of 2. 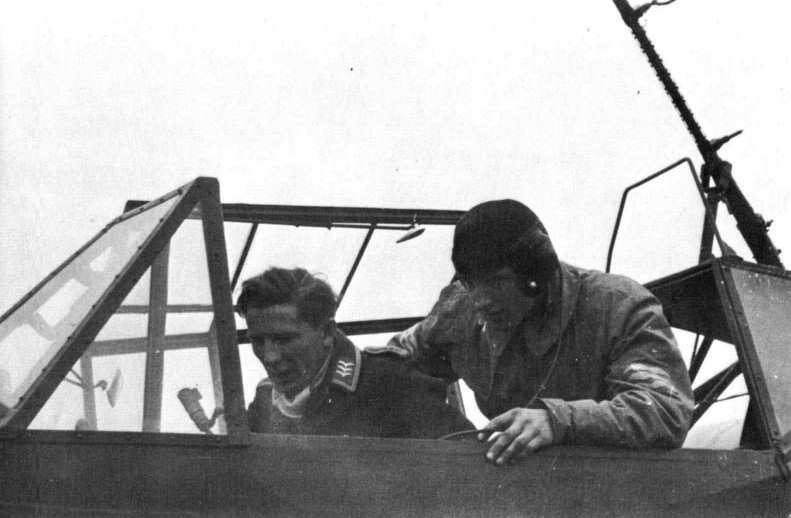 Staffel, JG 2, during pre-flight briefing. 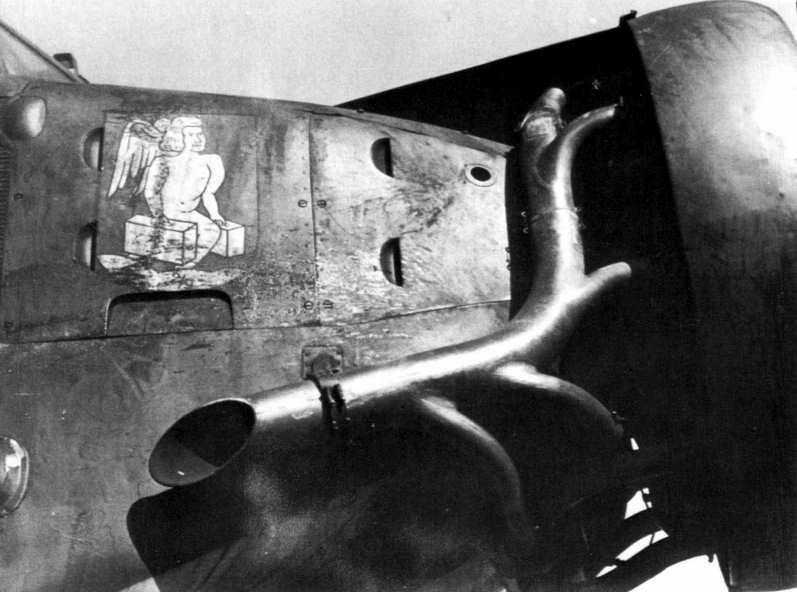 Note the eagle motif on the cowling sides. 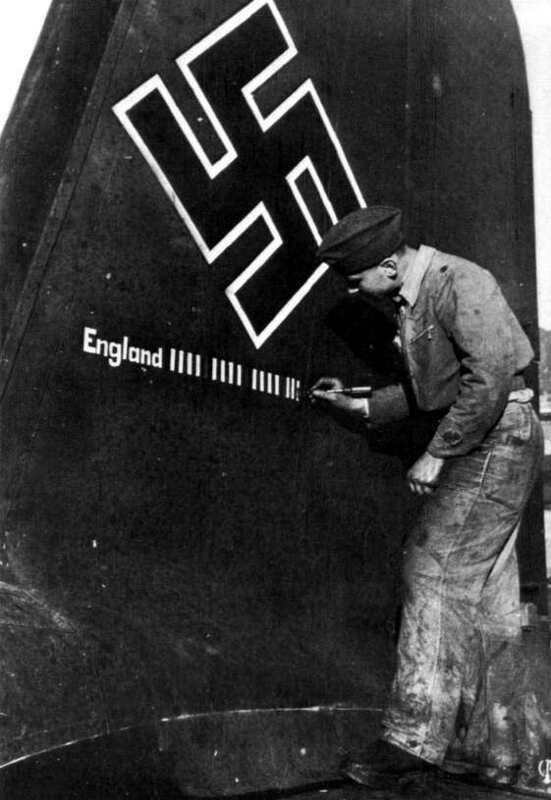 This marking was characteristic of many of JG 2's FW 190s. 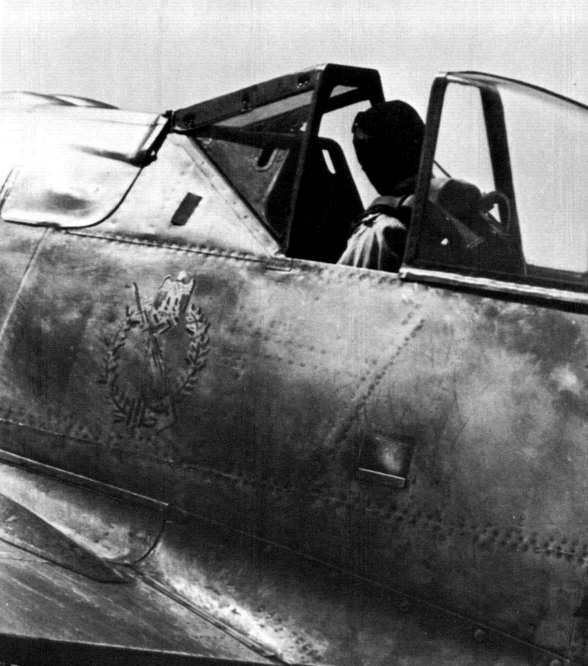 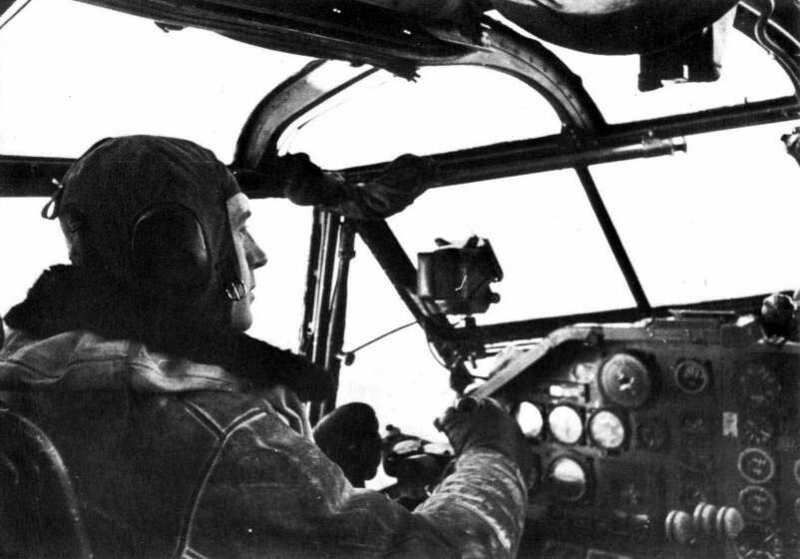 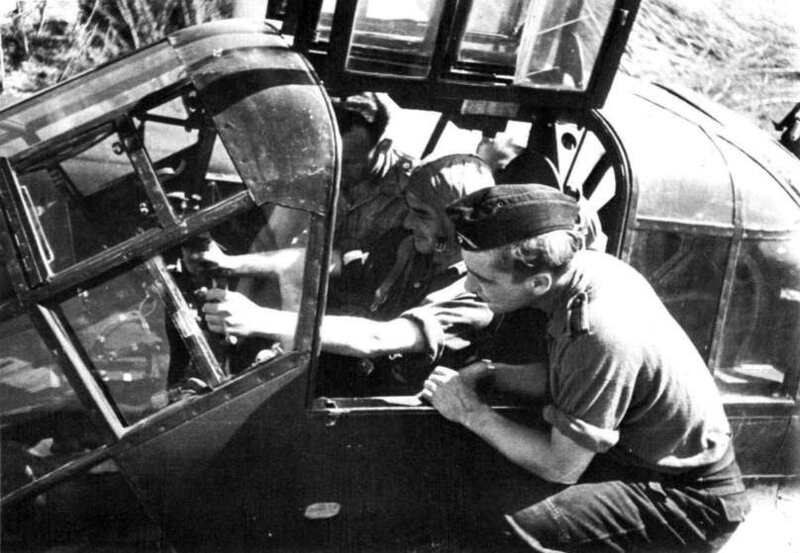 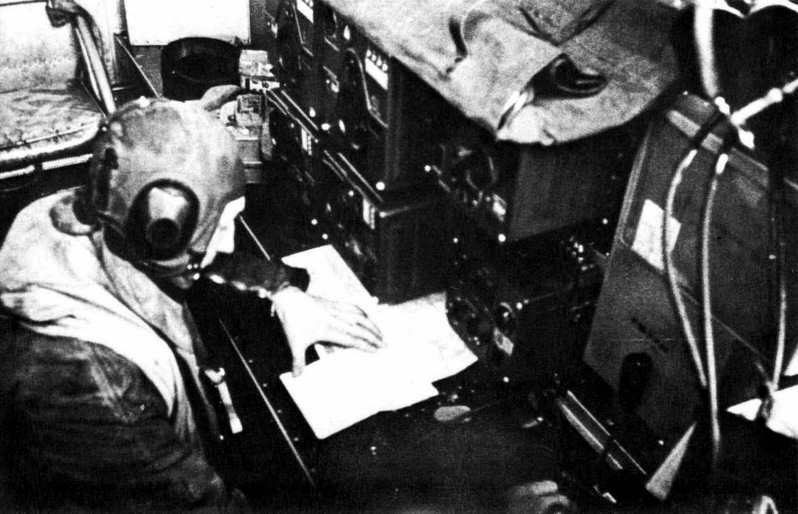 A pilot performs his "Sitzbereitschaft", or cockpit readiness. 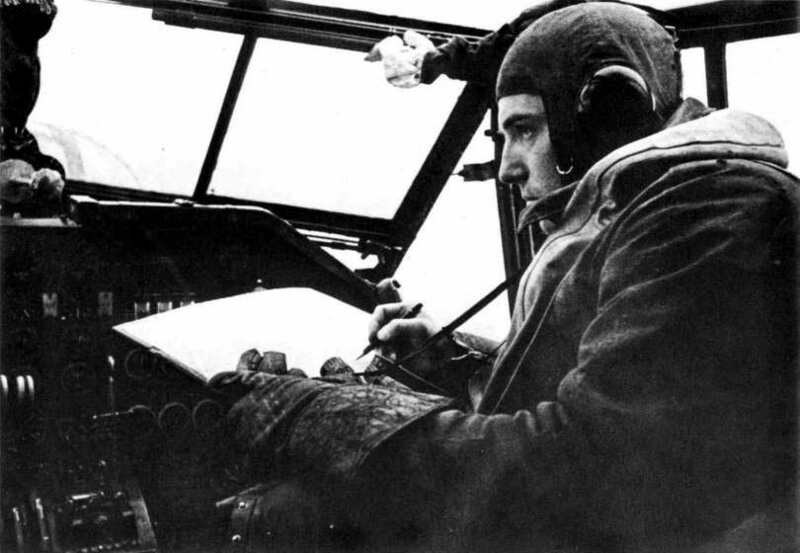 When the word is given he will take off, but until then or until relieved, he must remain in the cockpit. 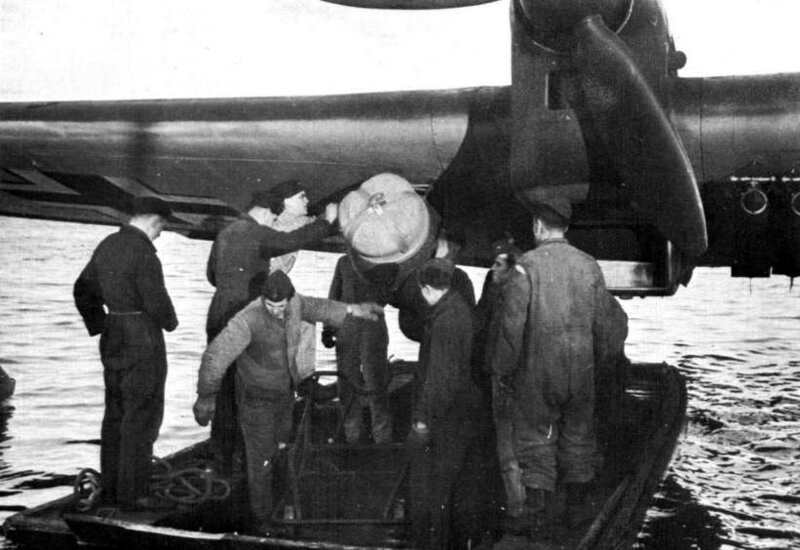 The small open access panel on the fuselage is the oxygen tank lead where the oxygen bottles in the plane are refilled. 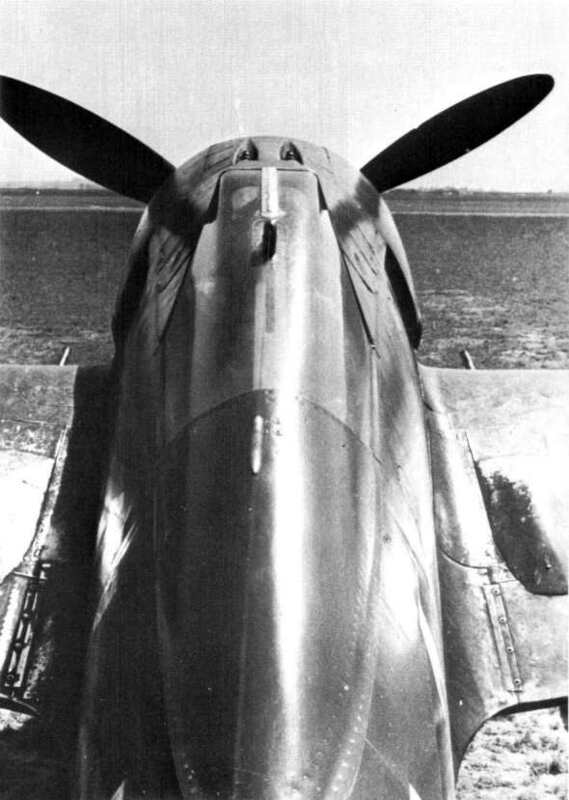 An interesting view of the upper surface of the fuselage showing the restricted view the pilot had in taking off. Note that the stress bar in the canopy is located actually underneath the plexiglass. 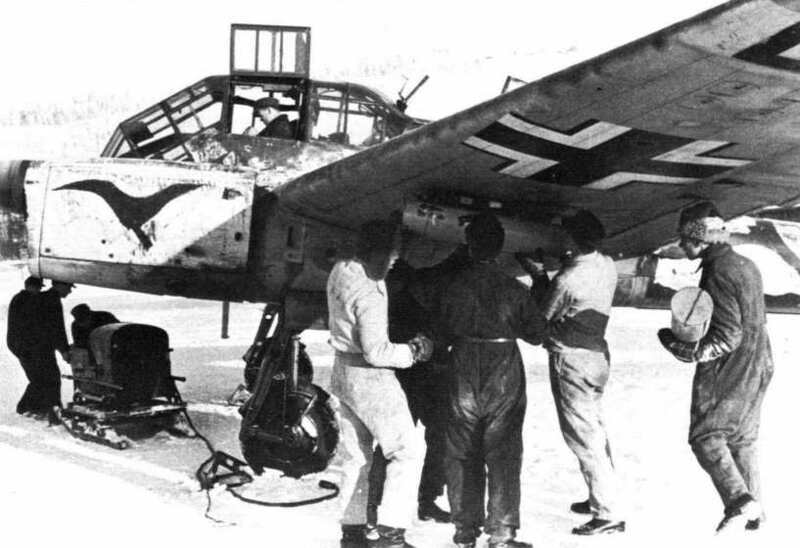 Here a FW 190 has its radio battery charged by a portable electrical generator. 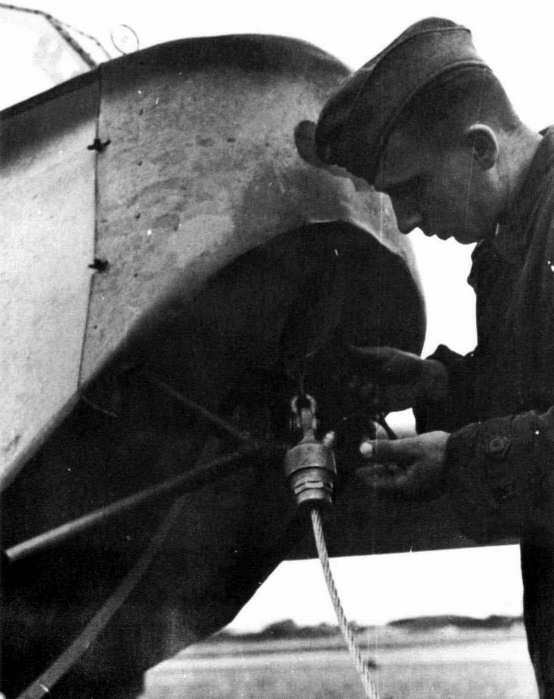 The jack from the cable is plugged into the connector to the battery compartment. 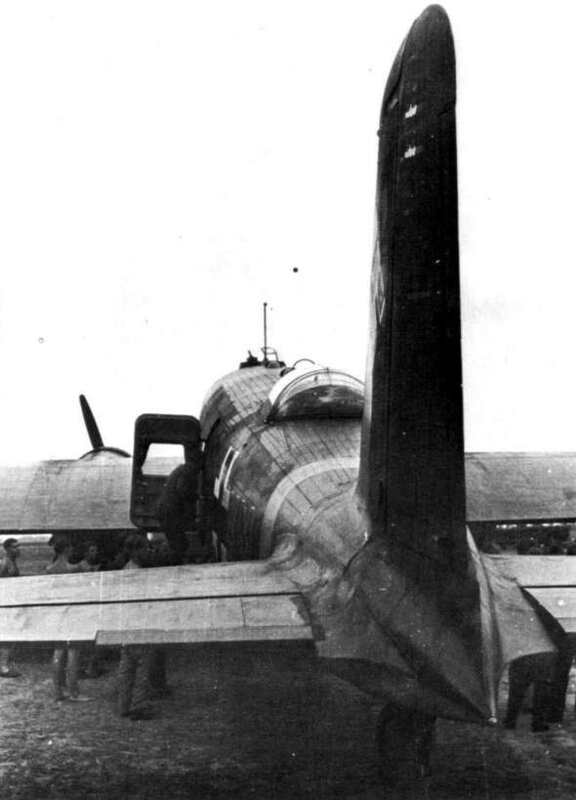 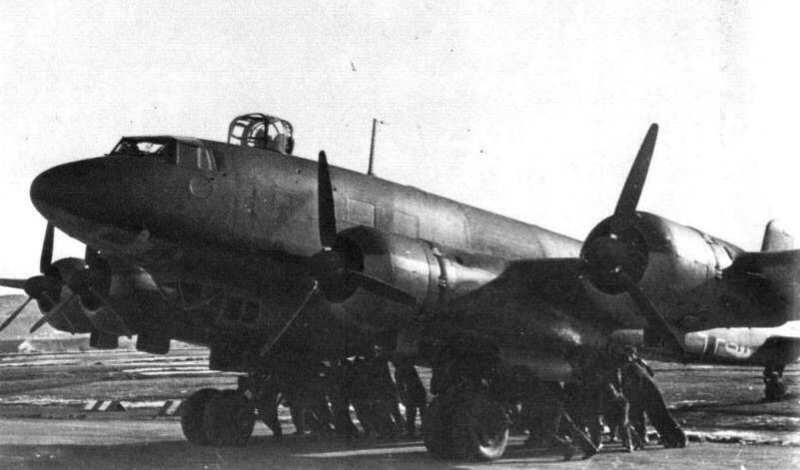 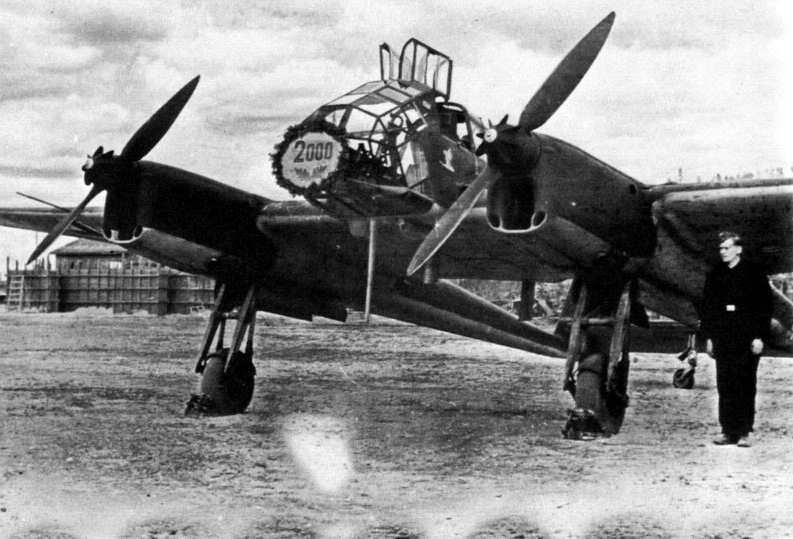 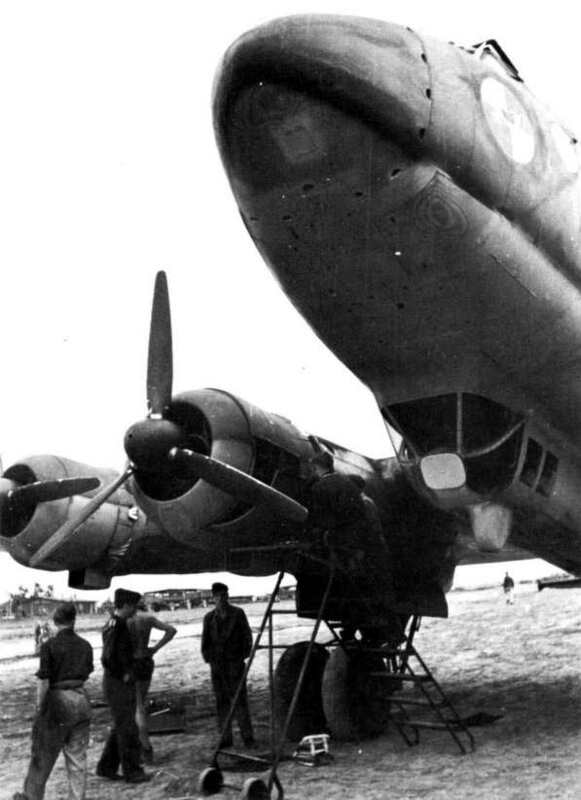 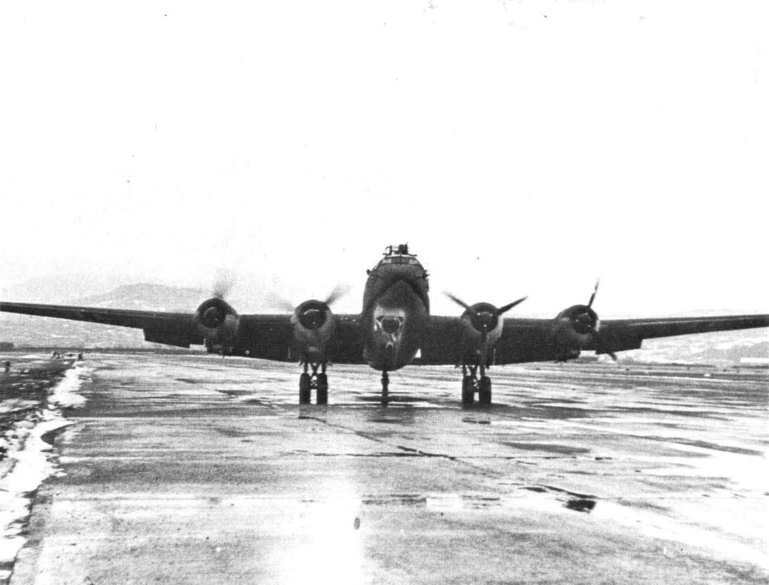 In this side view, one can see the protruding blast tube of the fuselage mounted 13 mm MG 131 that fired through the propeller arc, as well as the sturdy wide tracked landing gear. 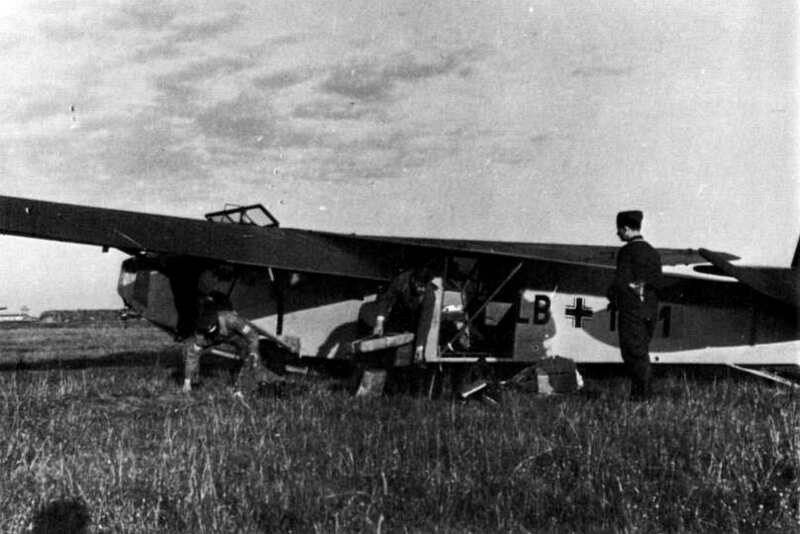 Preparing for an early morning flight. 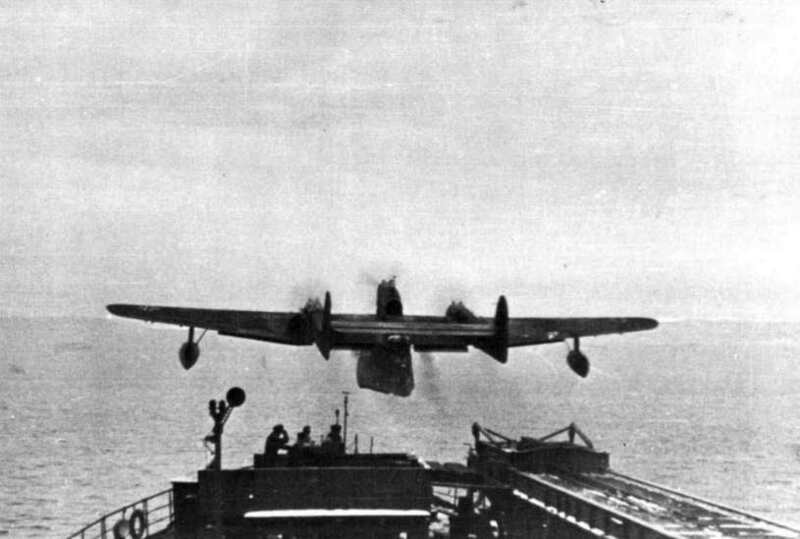 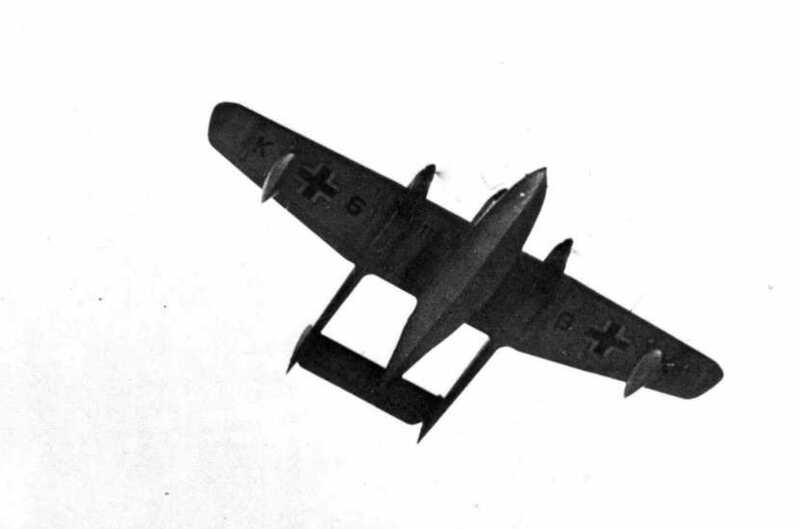 An interesting aid to the pilot is the small rod sticking up out of the wing's upper surface adjacent to each wheel, informing the pilot that the landing gear is extended. 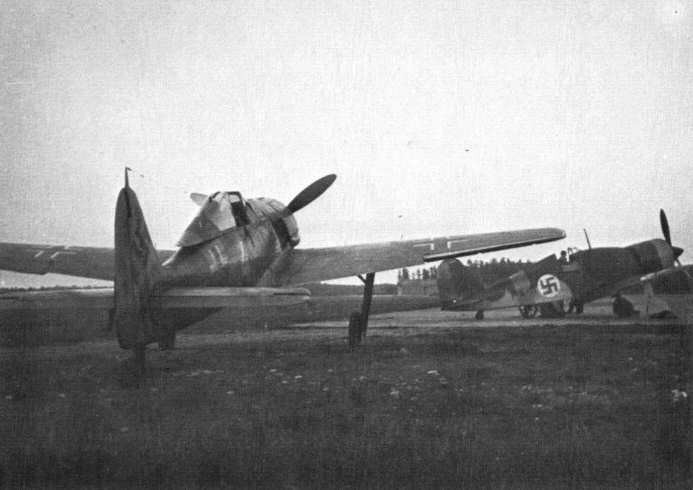 A unique photo of a FW 190 of JG 54 parked by a Finnish flown Fiat G-50 on an airfield in Finland. 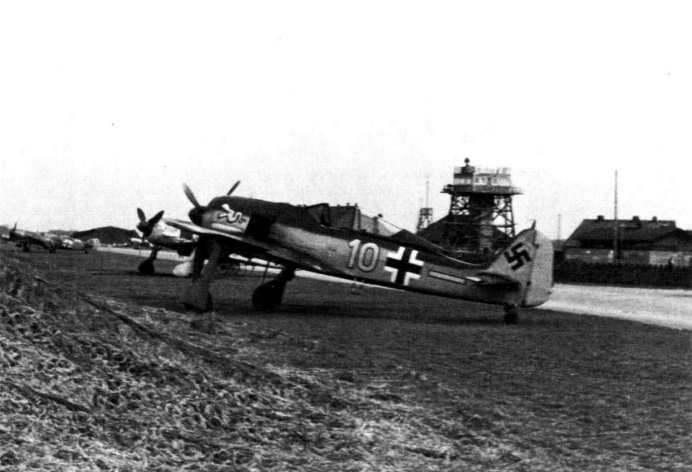 FW 190s of 4./JG I at their home base in Northern Germany. 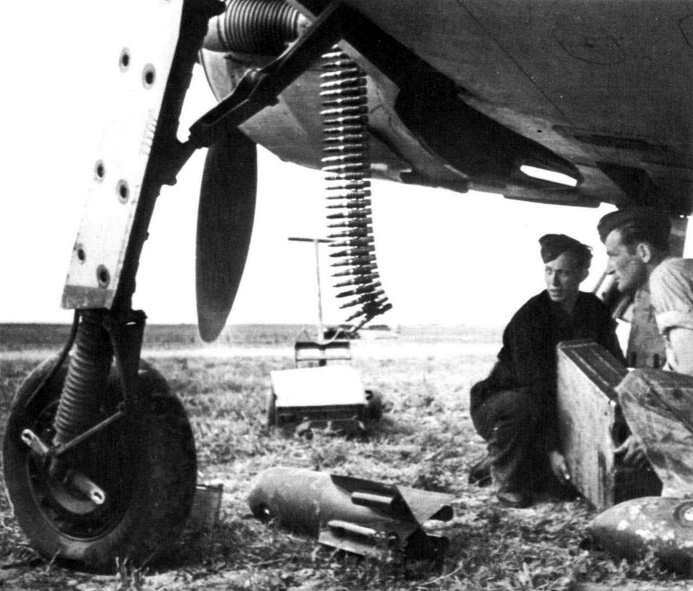 The small cart in the foreground is the battery charger. 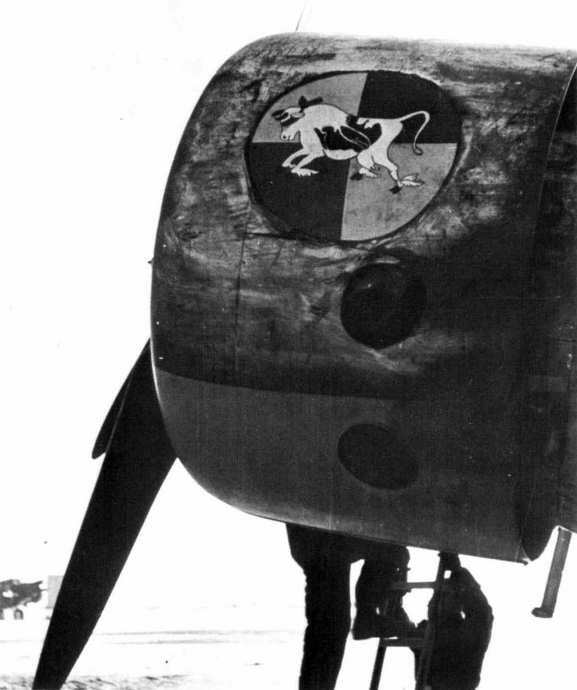 Barely visible is the plug to the battery compartment, somewhat covered by the national insignia on the fuselage. 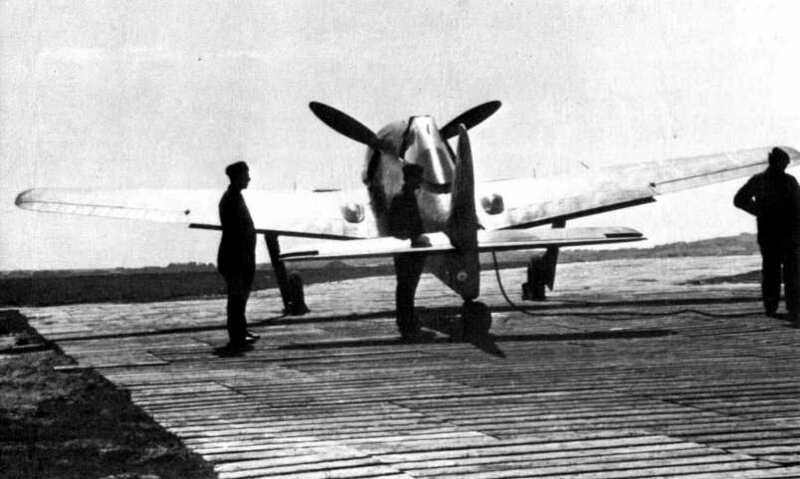 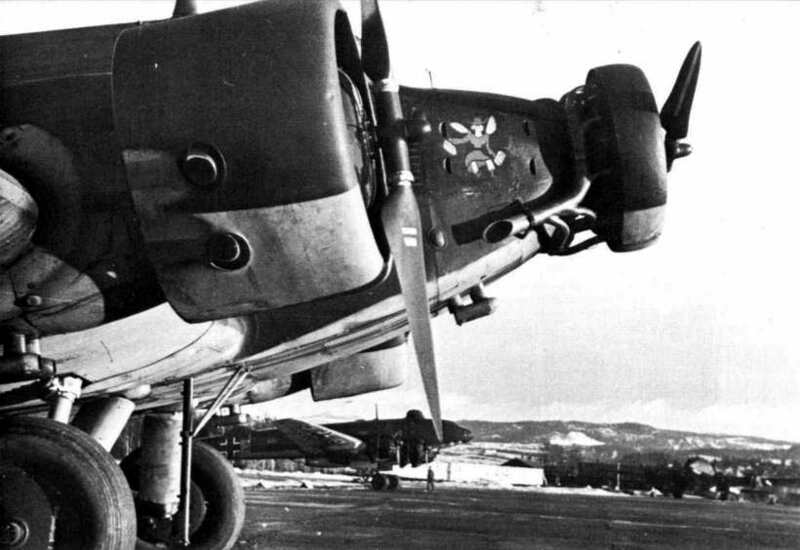 A FW 190A prepares to take off. 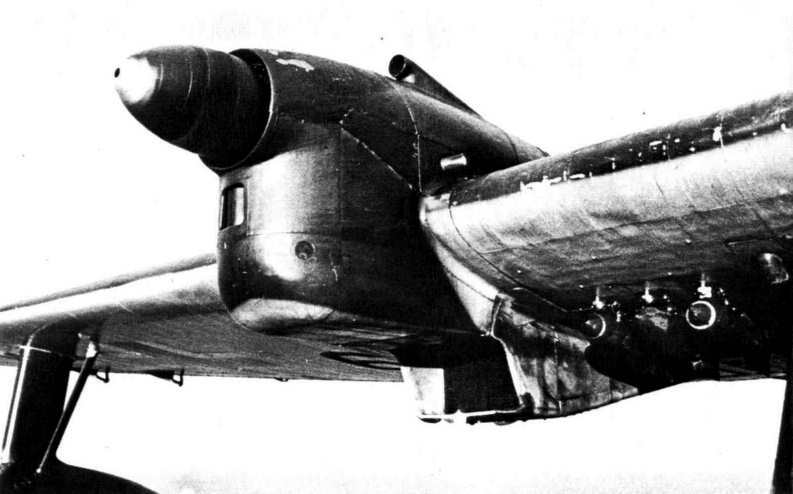 The bumps near the wing roots are access panels to the breeches of the 20 mm MG 151 cannons. 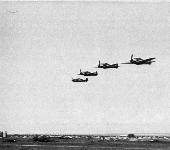 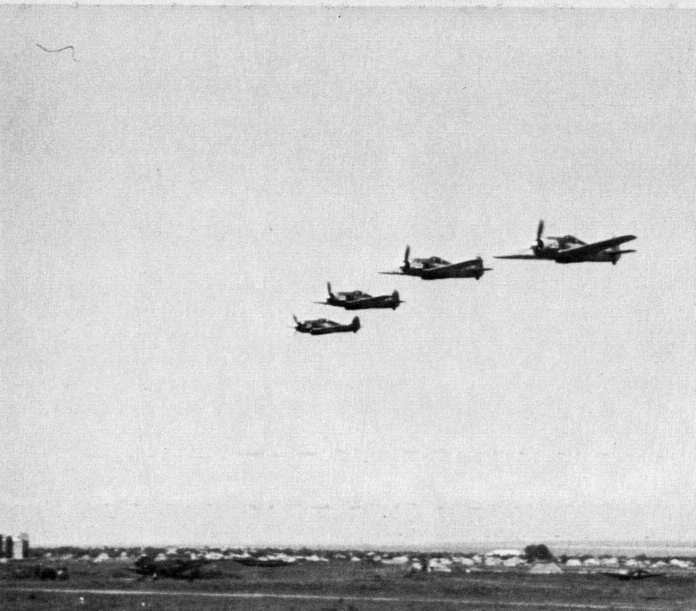 A "Schwarm' (flight of four) of FW 190As of JG 3 flies over its home base in Holland. 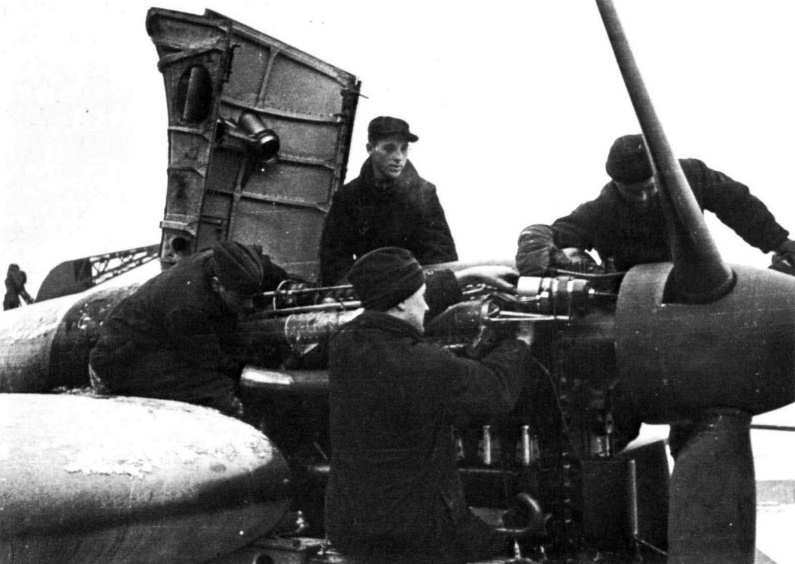 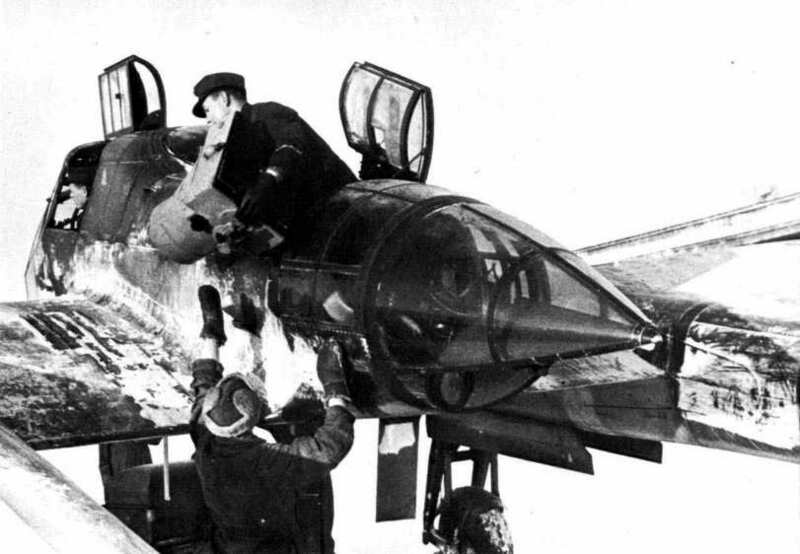 Mechanics in the process of tearing down the BMW 801D engine on a FW 190A. 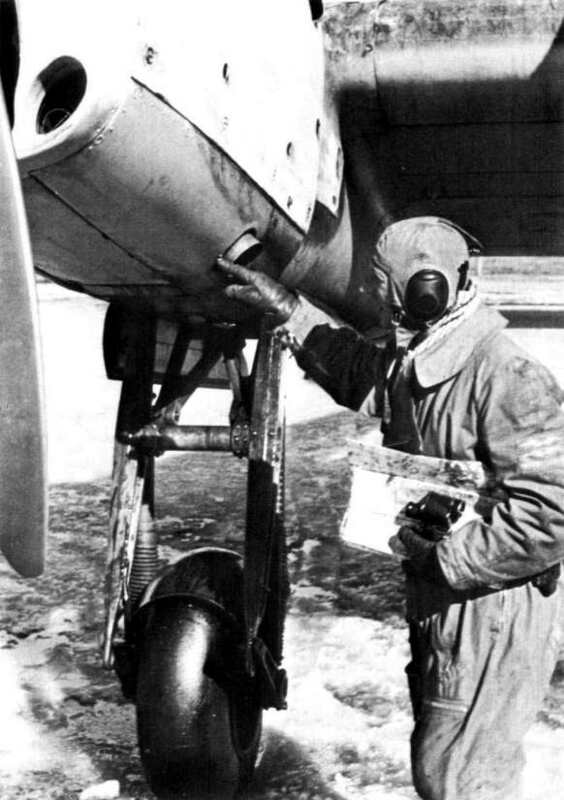 Note that when the cowling access panels are removed, the mechanics have unrestricted access to the engine. 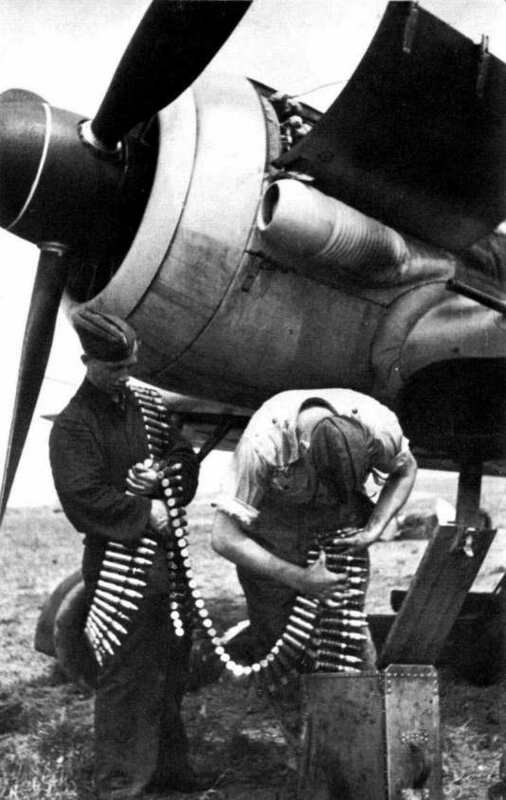 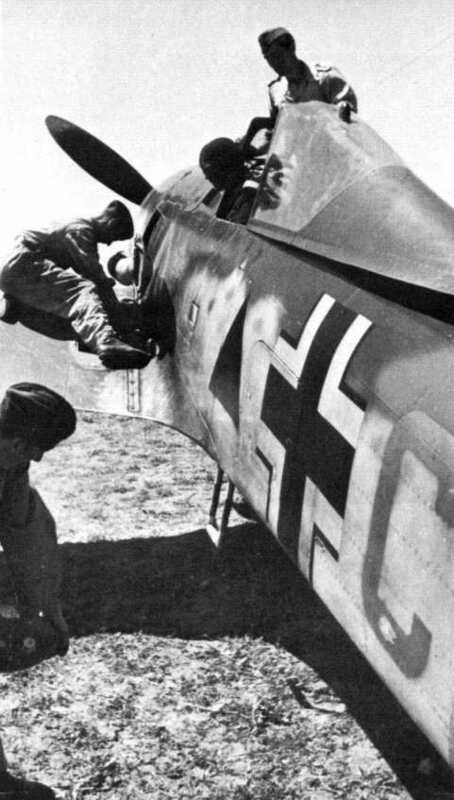 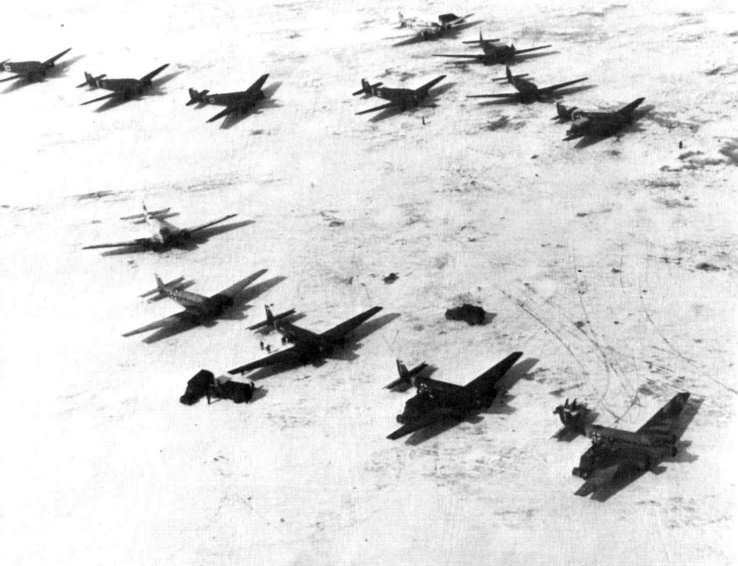 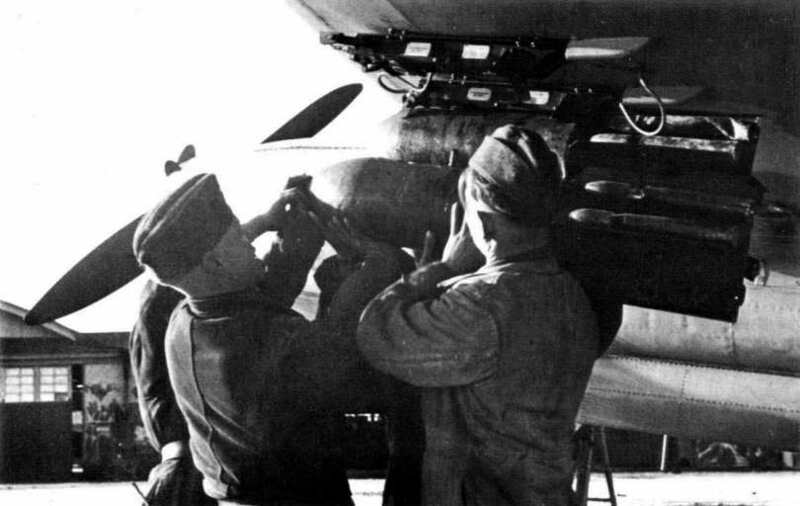 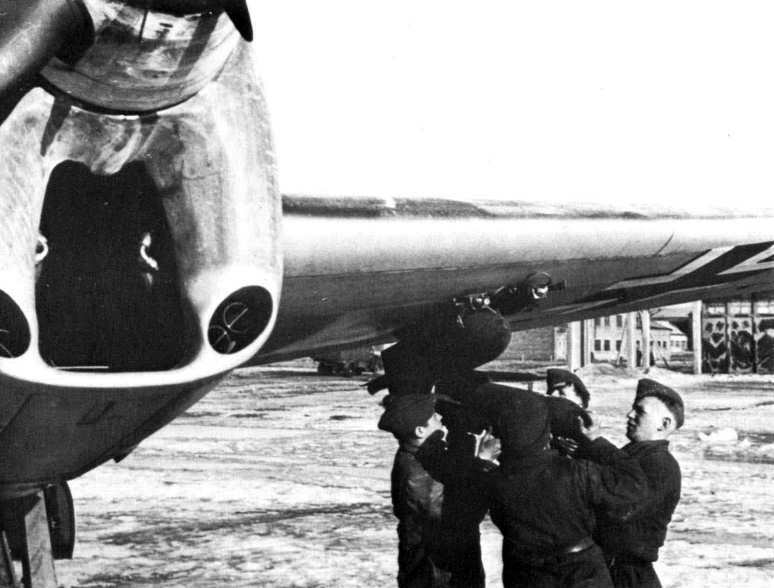 The armorers prepare to hook another belt of ammunition to the one dangling from the wing. 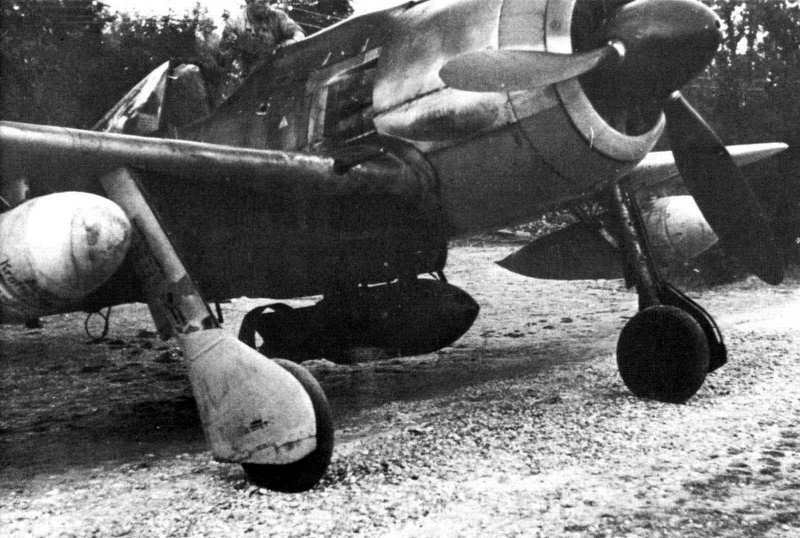 This FW 190 has had its wheel covers removed to prevent mud from gathering between the wheel and wheel cover. 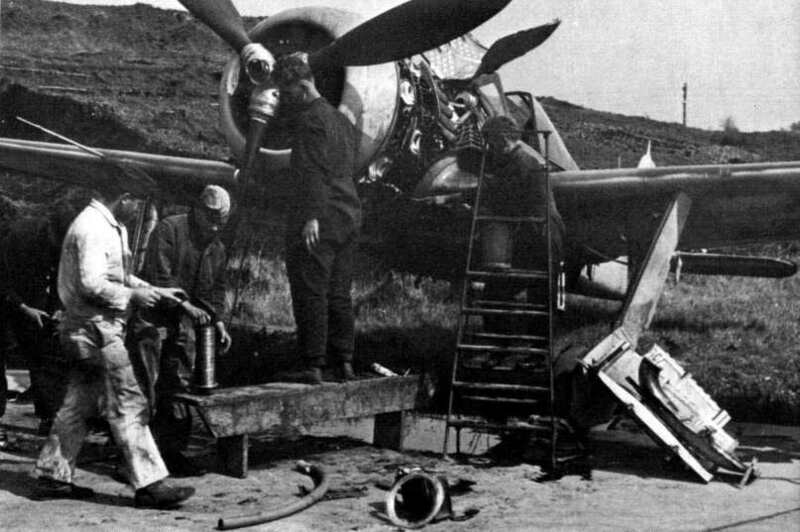 A crash-landed FW 190. 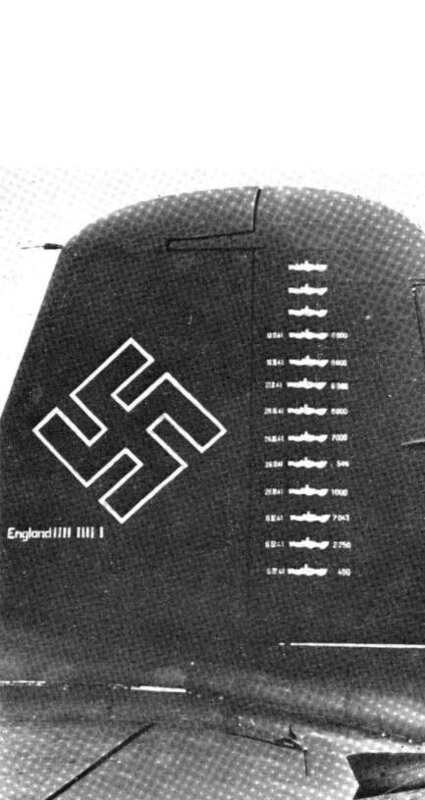 This aricraft will obviously never fly again. 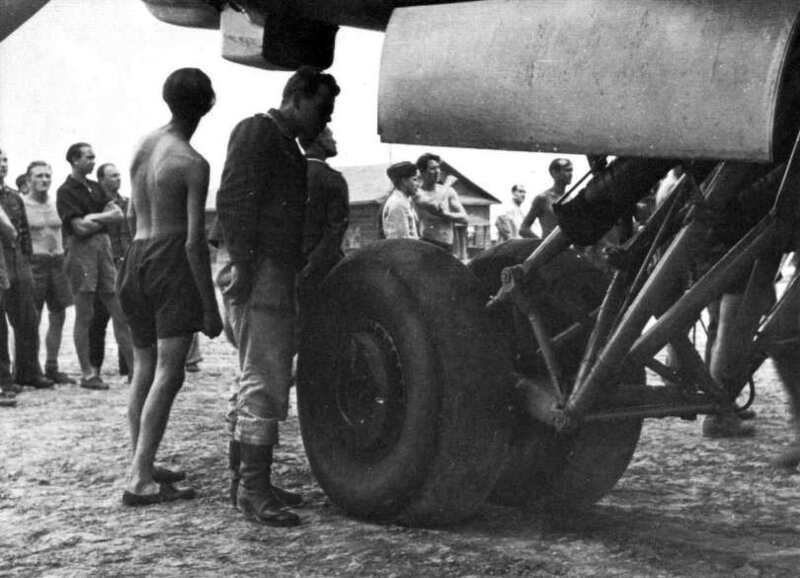 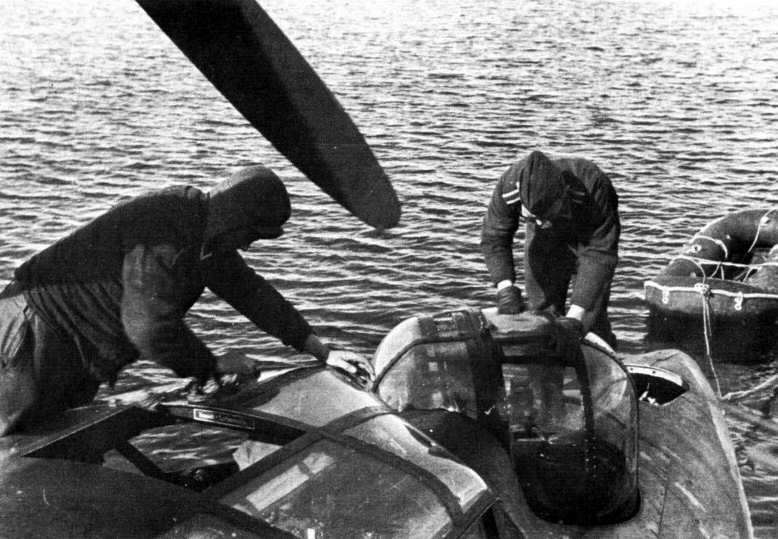 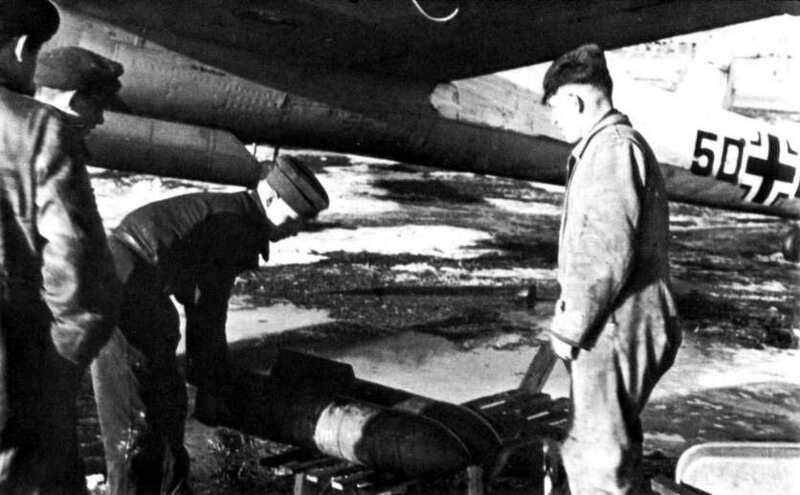 Ground crew men unravel the tow cable prior to hooking it to the towing attachment on a Ju 87 dive bomber's tail wheel. 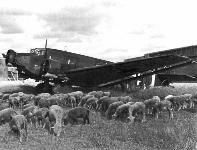 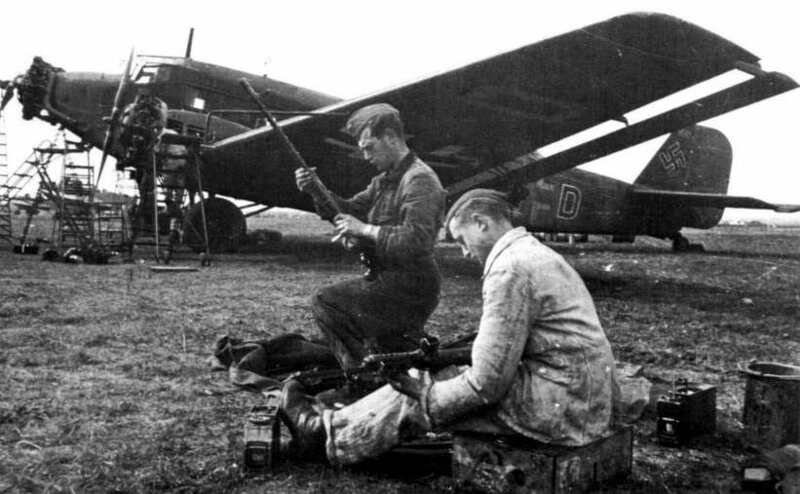 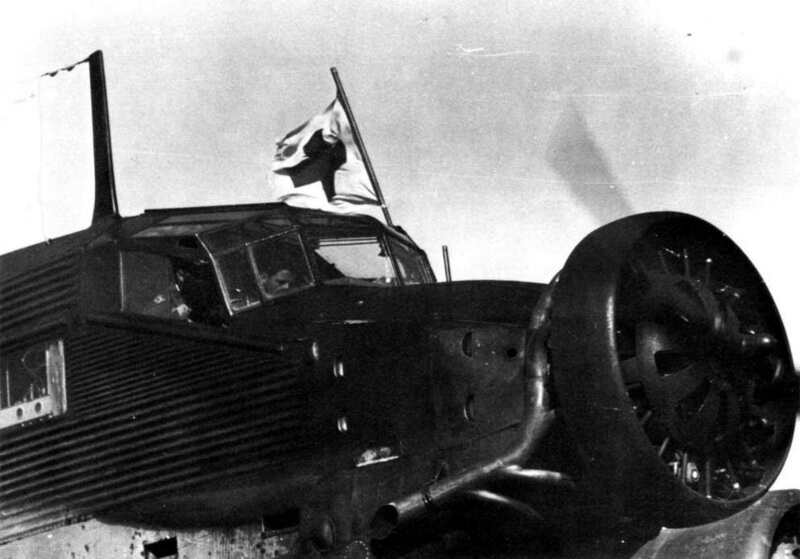 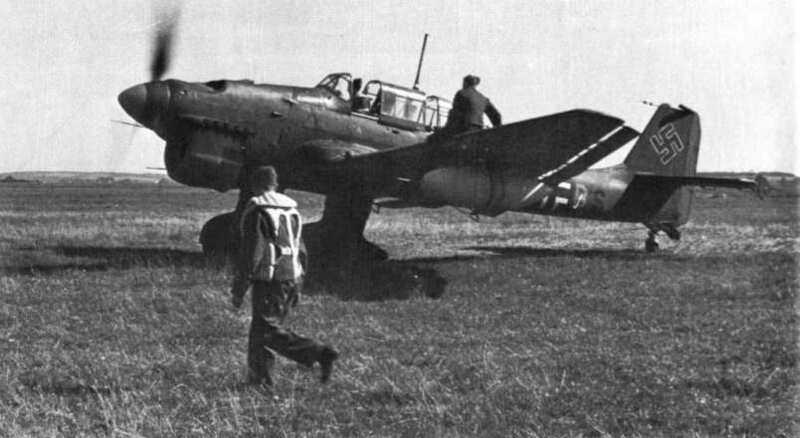 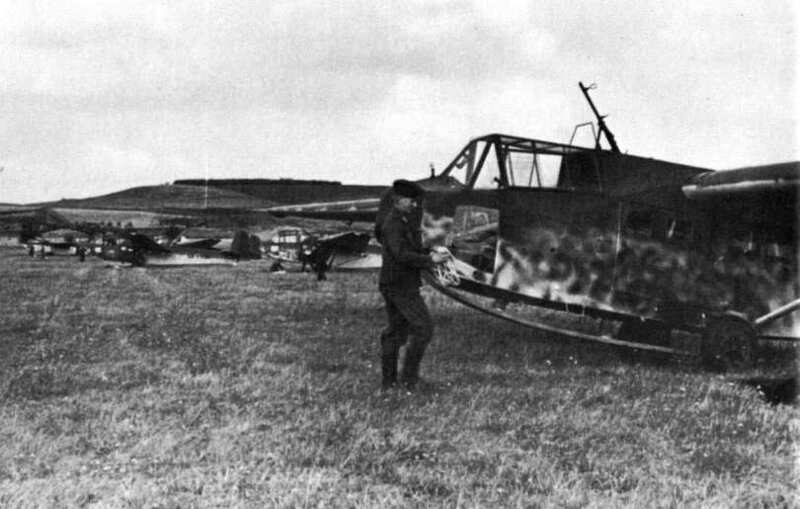 In this photo, the tow cable may be seen strung out between the DFS 230A glider and the Ju 87R tow plane. 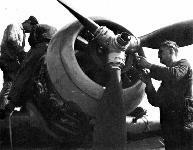 The ground crew NCO in the foreground is tightening the retaining bolt with a wrench. 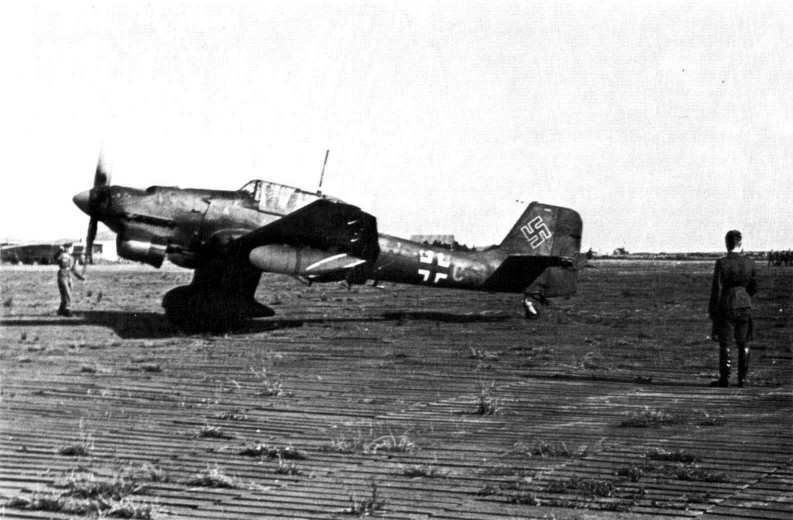 The Ju 87R-3 tow plane begins it taxi to the runway before take-off. 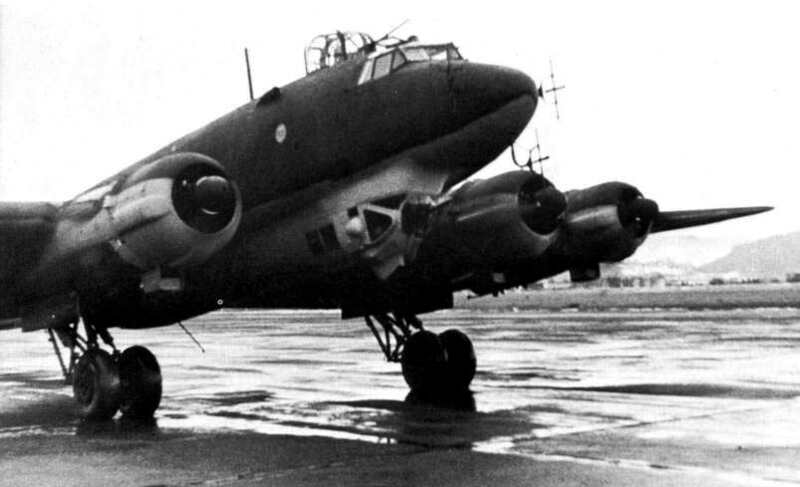 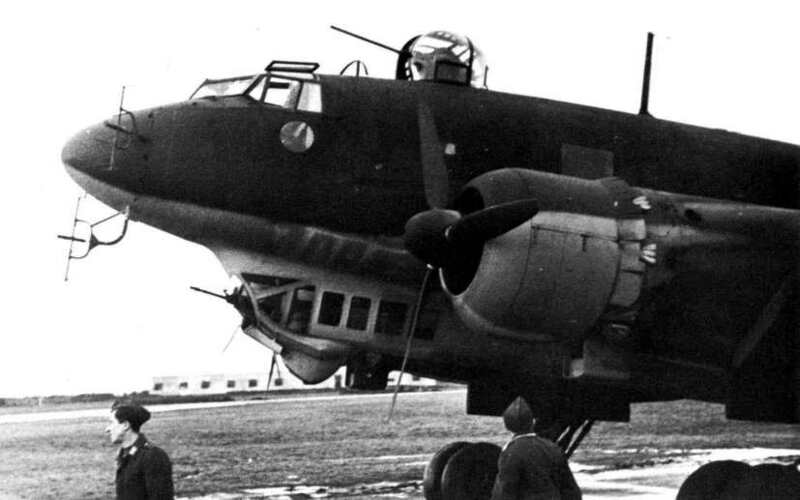 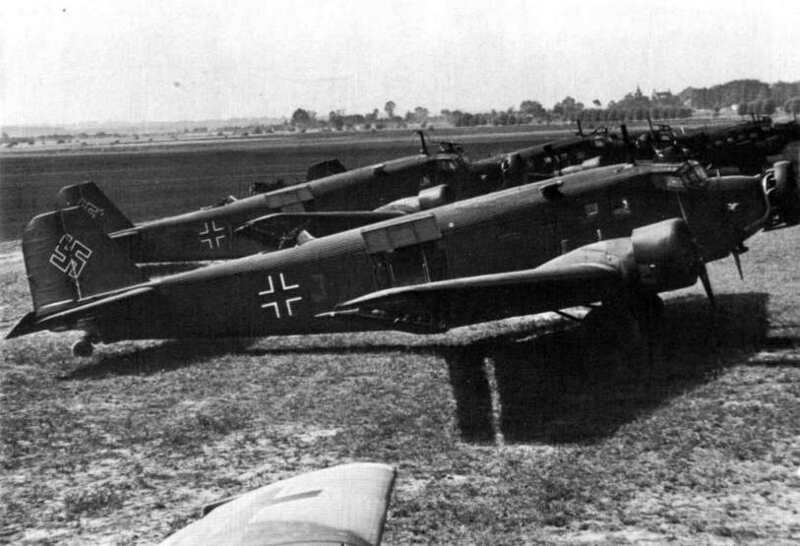 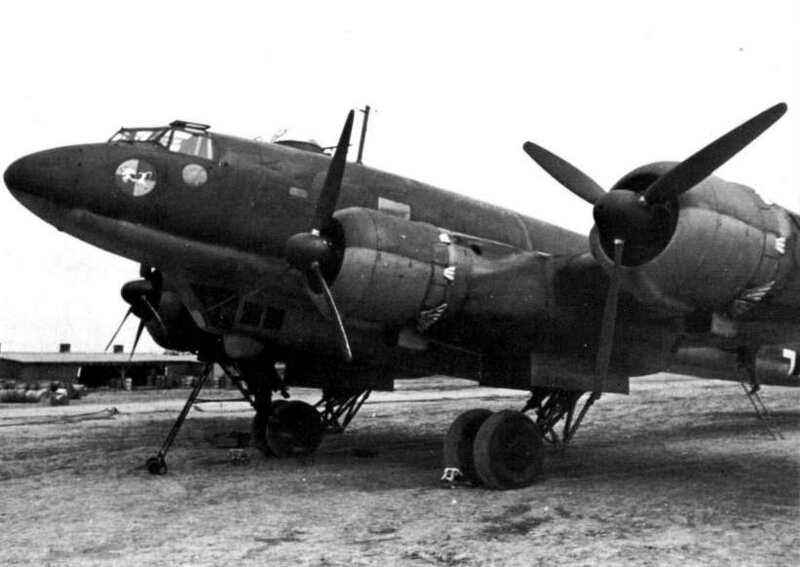 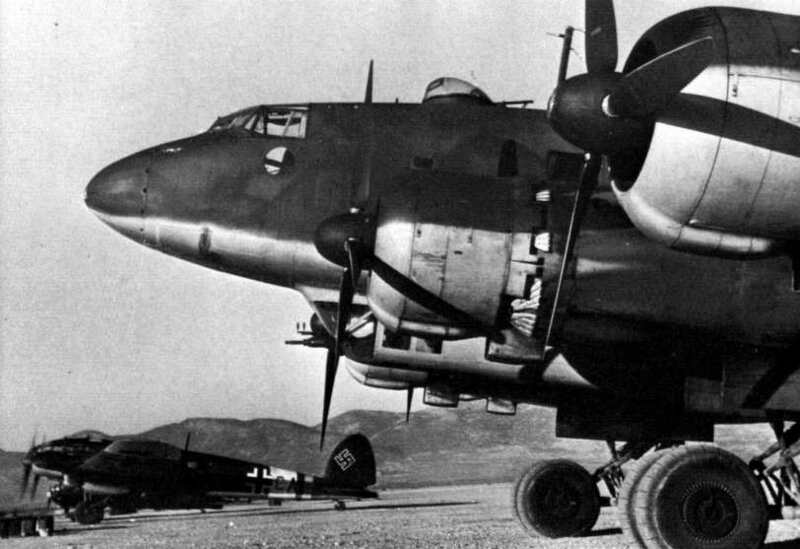 Both the Ju 87R-3 and Ju 87R-4 were fitted with glider tow attachments. 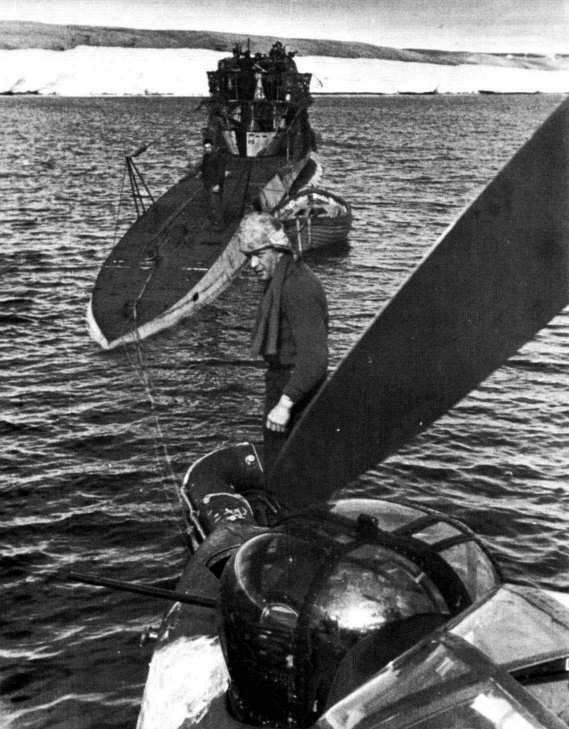 Note the crew member in the foreground wearing a floatation vest. 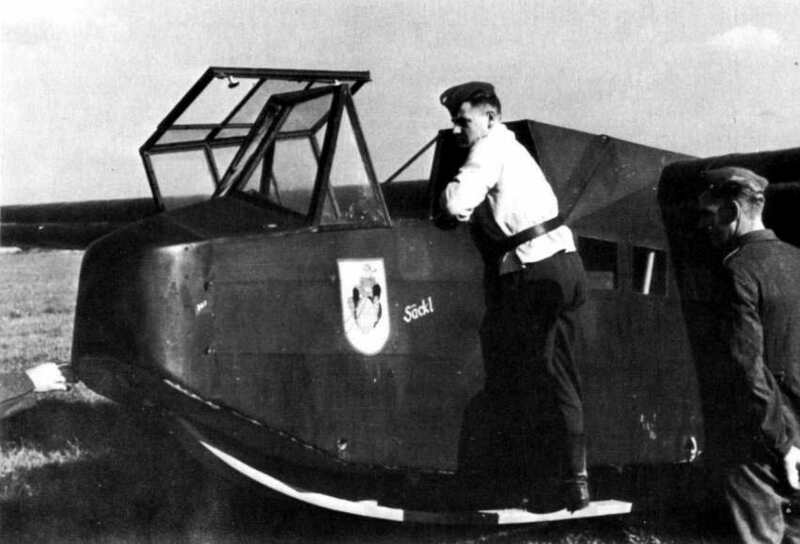 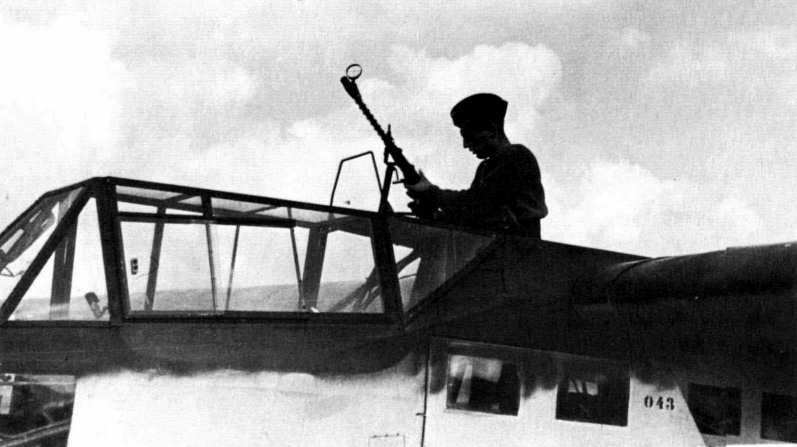 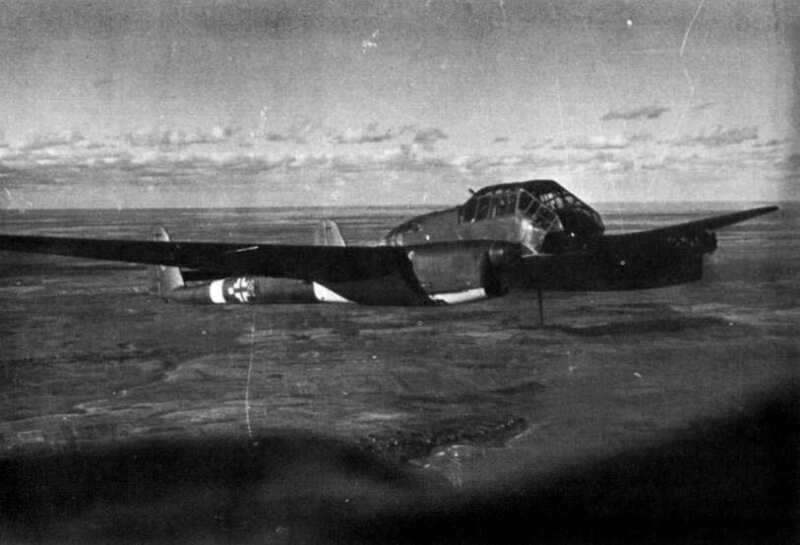 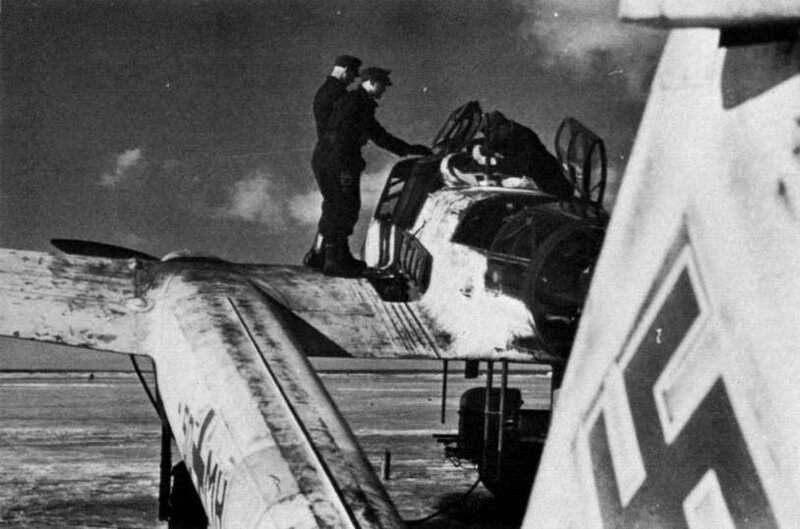 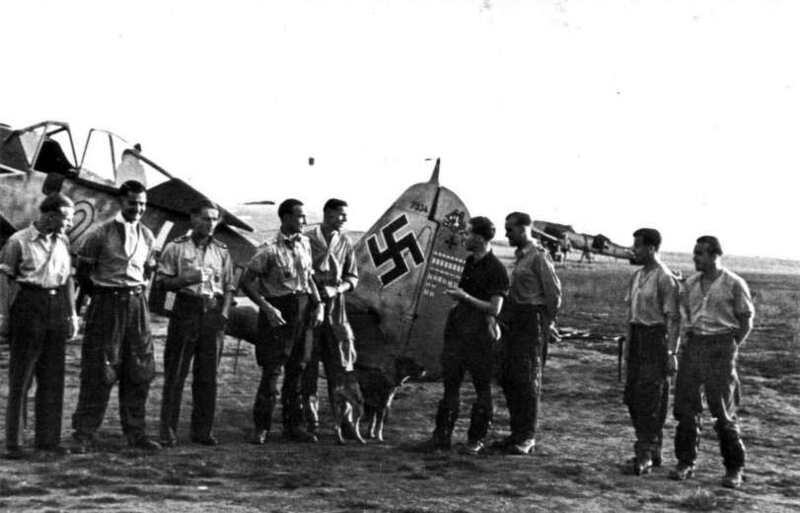 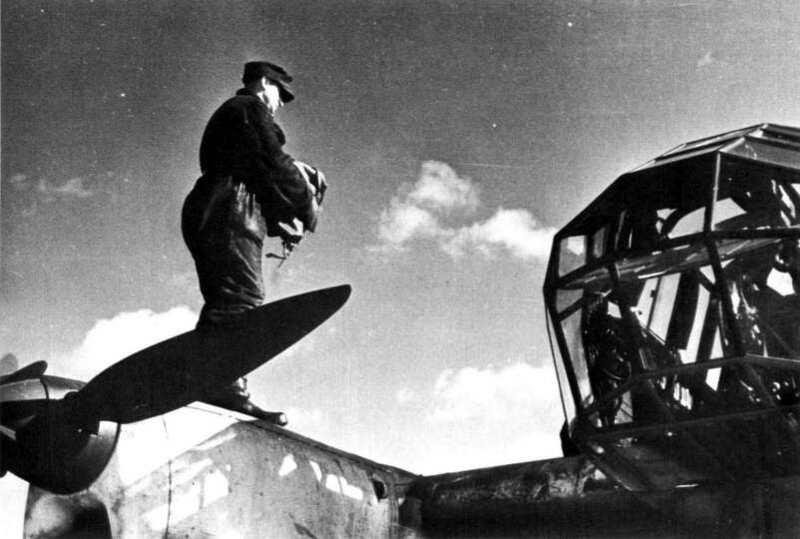 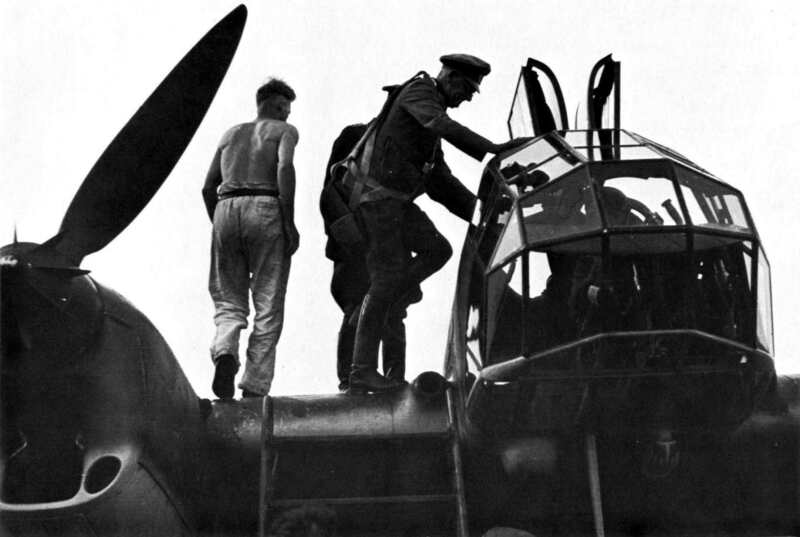 The crew man sitting on the wing of the "Stuka" is helping to guide the aircraft as the pilot's visibility during take-offs was somewhat restricted by the plane's cowling. 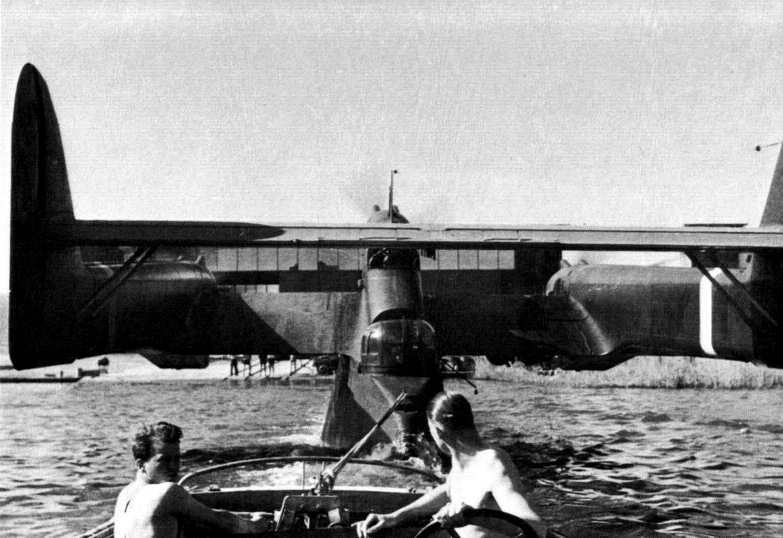 Prior to take-off. 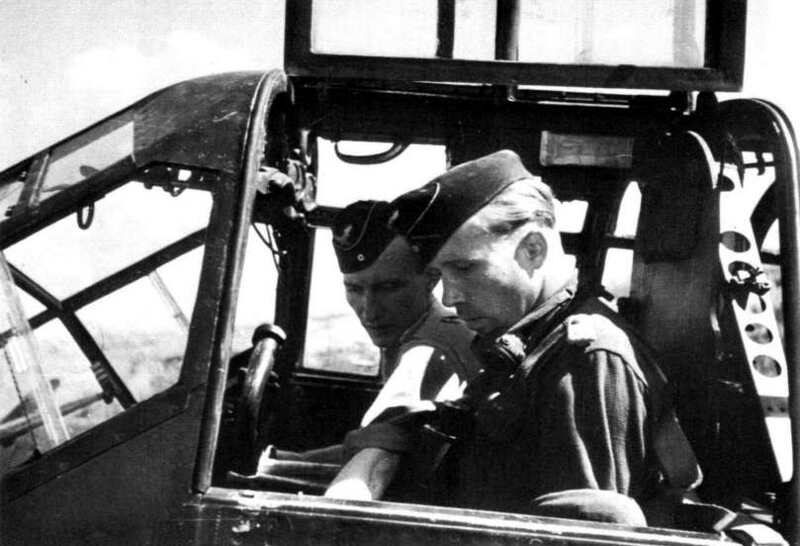 With brakes on and throttle forward, the pilot revs up his engine in order to lift the loaded glider he will be towing aloft. 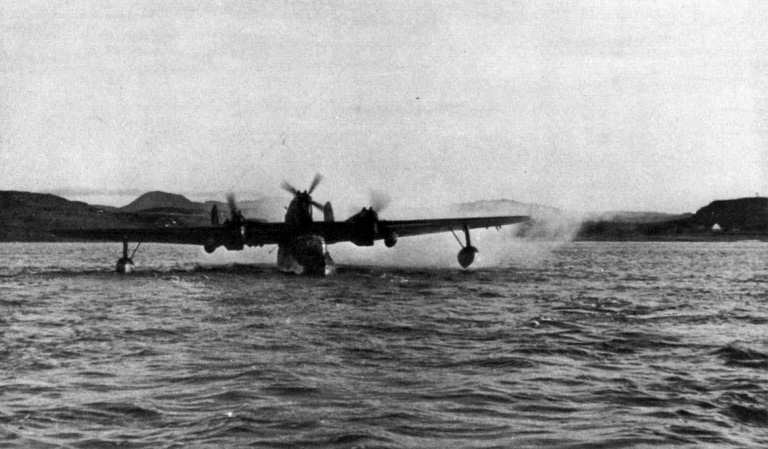 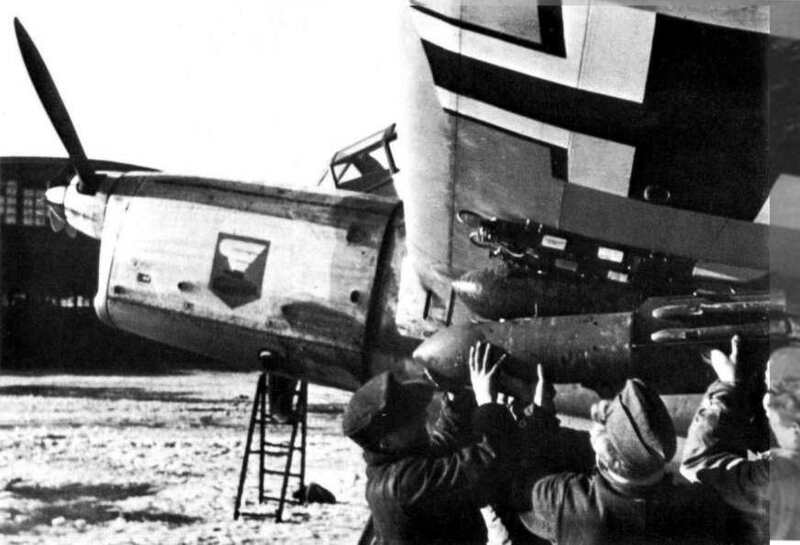 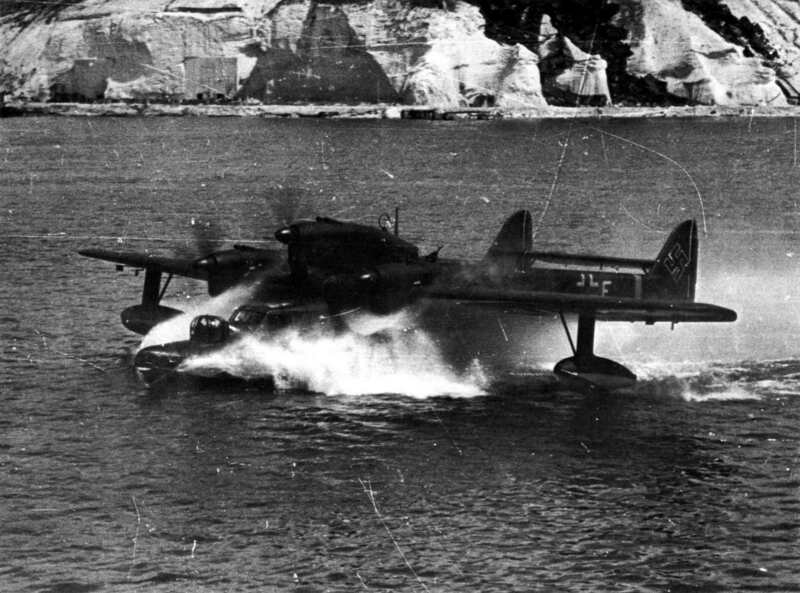 Straining for altitude, the pilot of this Ju 87R-3 applies full power to his engine. 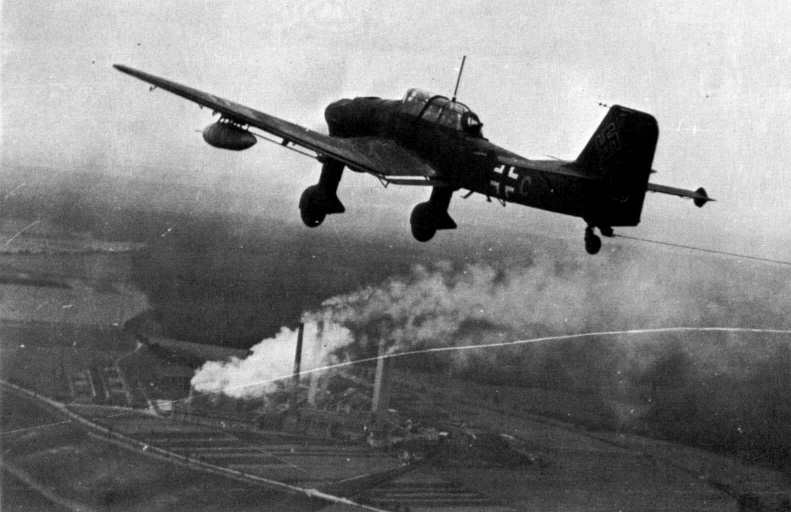 It is believed that these photos were taken in the Hannover-Magdeburg region of Northwest Germany, a prime area for such training. 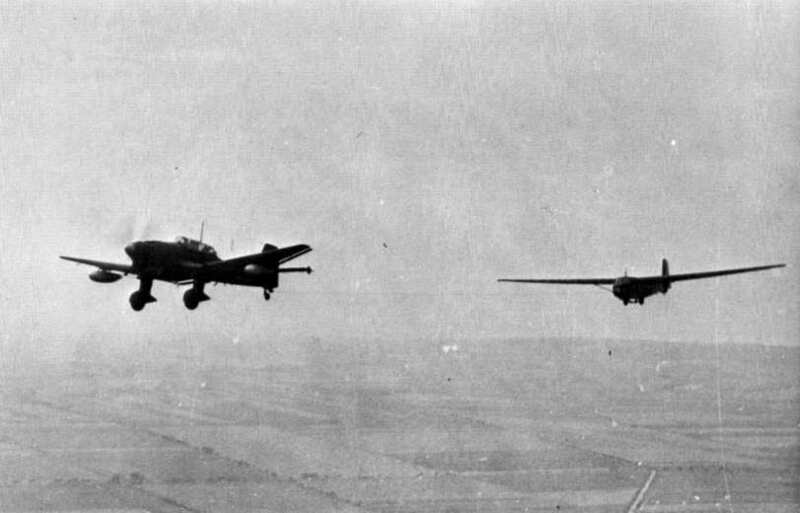 Finally aloft, the Ju 87R and its DFS 230A mate, level off and head for their destination over the northwest German flatlands. 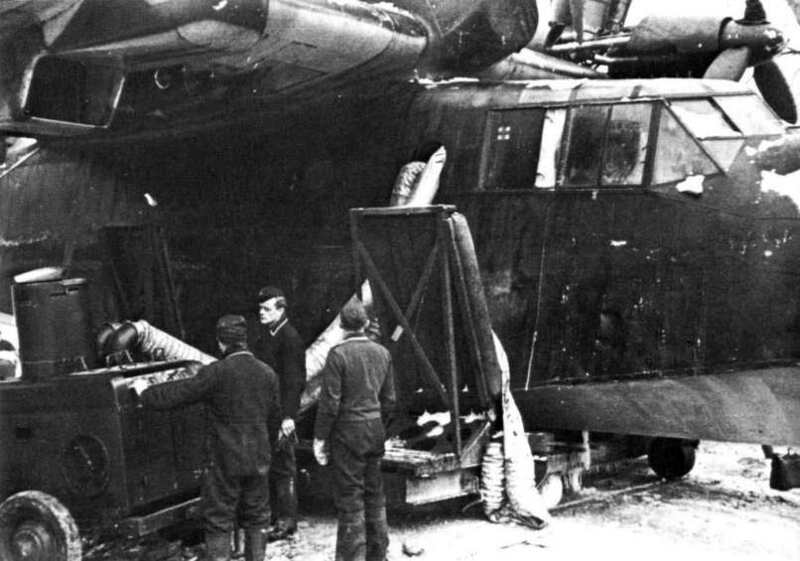 This DFS 230A is one of the gliders that was to be used in the proposed air invasion of Malta. 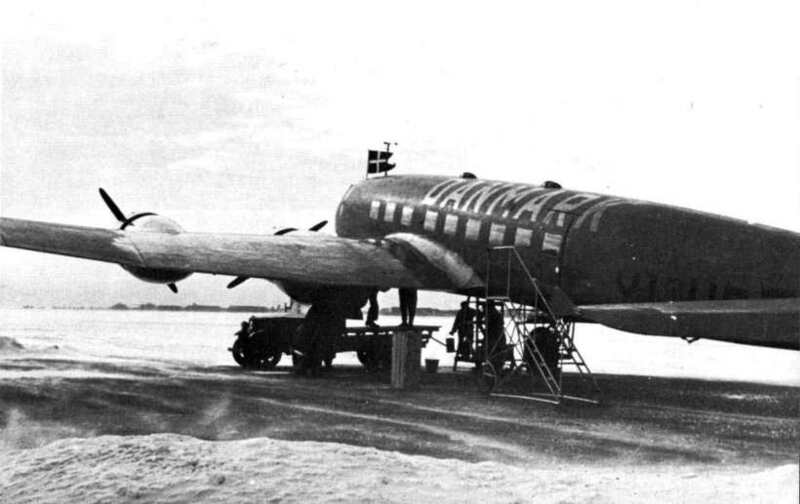 Note the color scheme of Green 71 uppersurfaces and Blue 65 fuselage sides and undersurfaces. 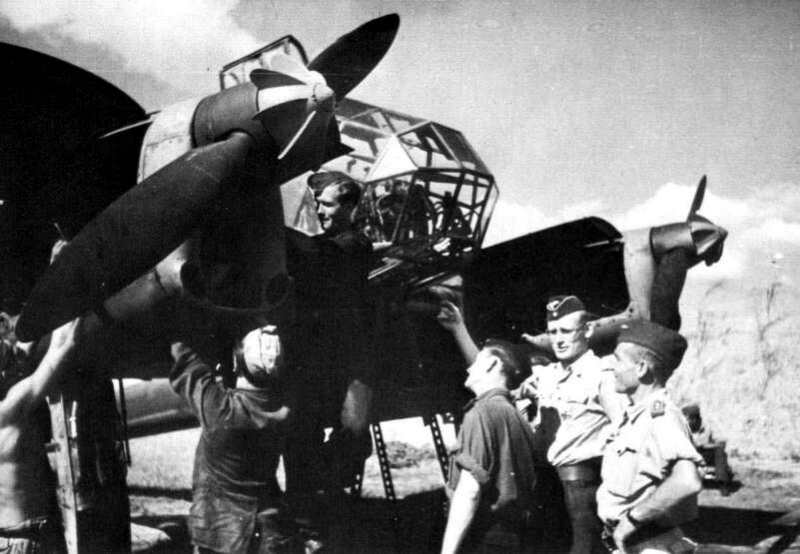 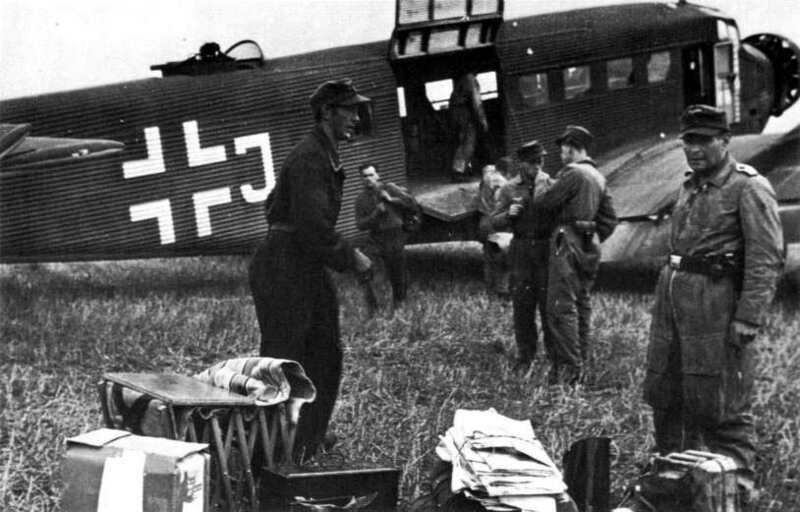 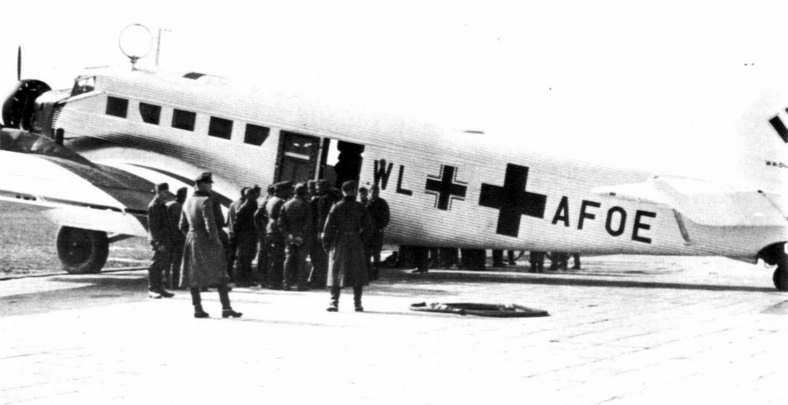 Luftwaffe ground crewmen (the NCO looking into the cockpit is wearing a summer tunic) prepare to tour an early DFS 230A back to the airfield after it has landed. 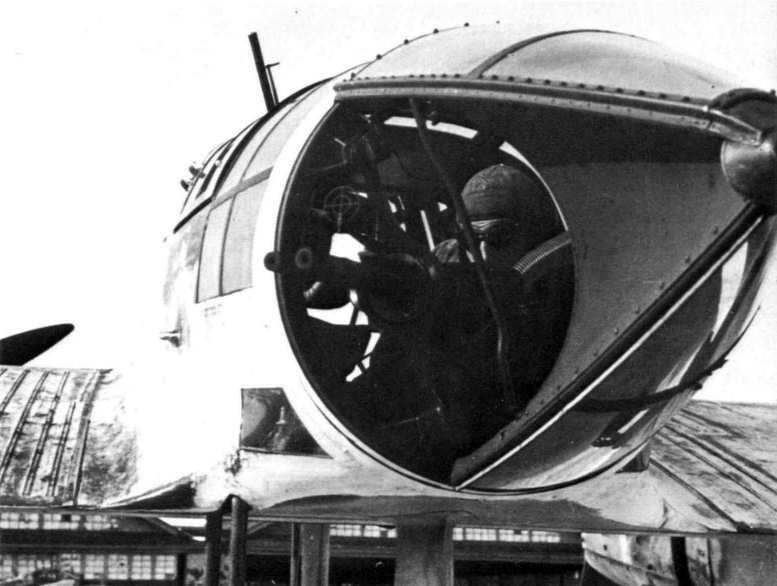 This early version is distinguished from the later version by addition of extra window in the nose to allow the pilot better downward vision. 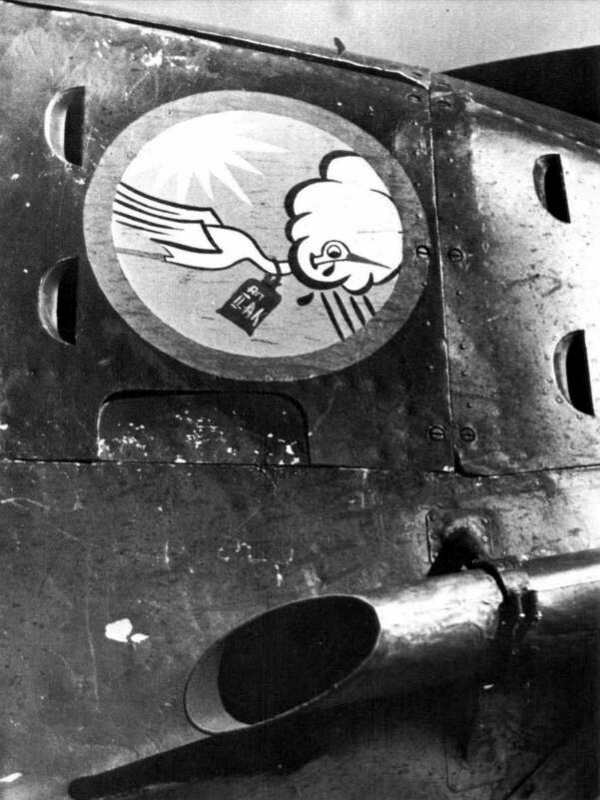 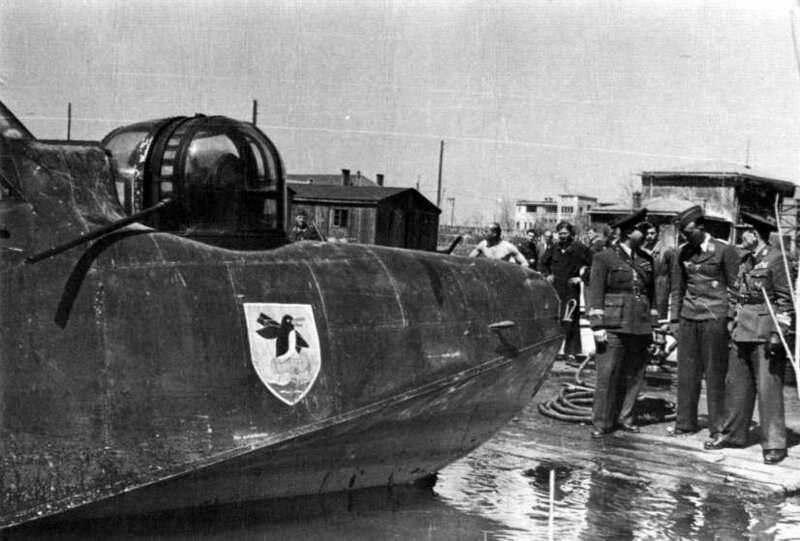 The design on the nose is either a personal insignia or an as-yet unidentified unit insignia. 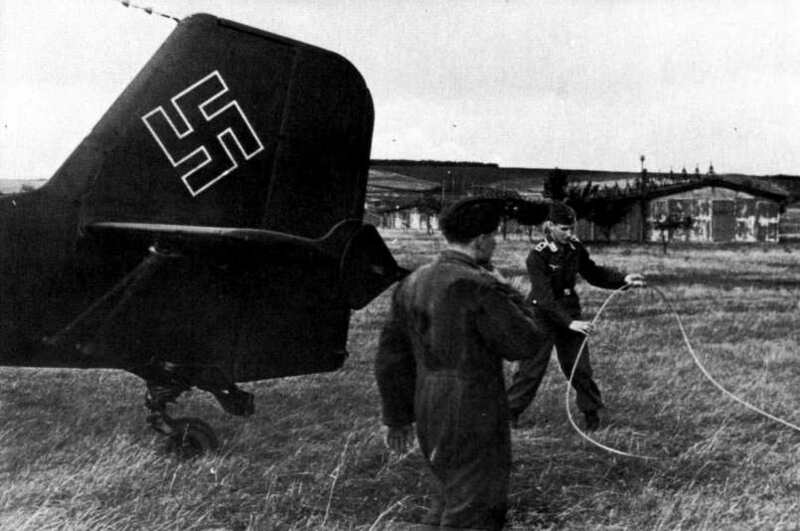 Here a NCO pilot in flight suit shows his "office" to a NCO of one of the Flak units guarding the airfield. 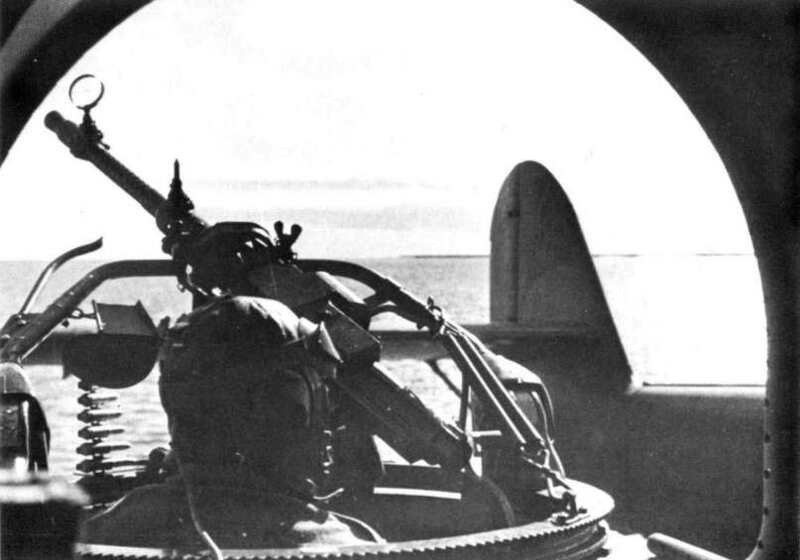 Note the 7.92 mm MG 81 machine gun on its mounting behind the pilot. 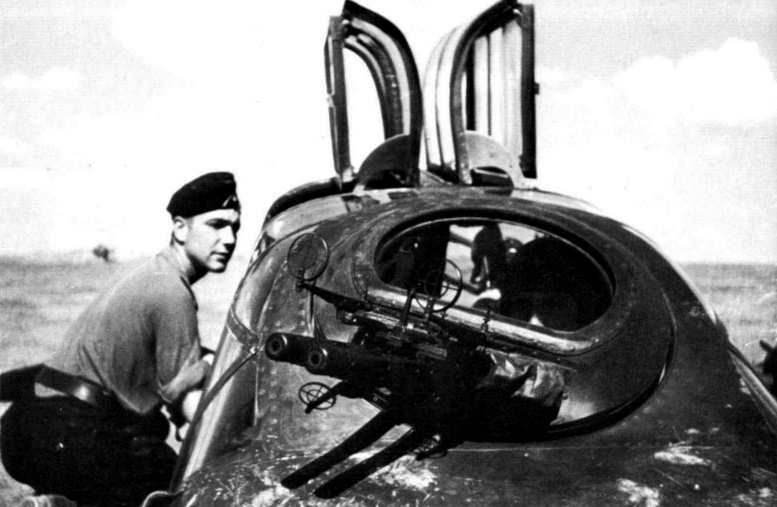 An armorer mounts the MG 81 into its swivel mount. 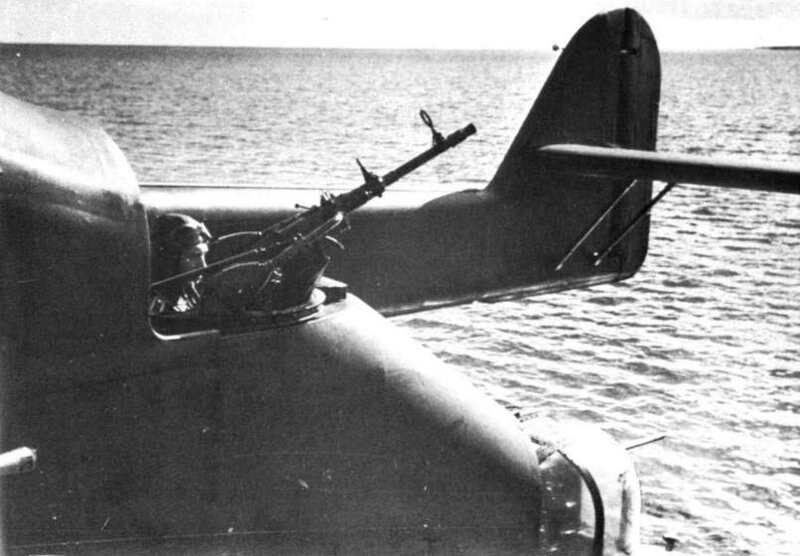 All versions of the DFS 230 carried such armament and many such gliders attached to air-landing assault units mounted extra guns that could be fired by the pilot. 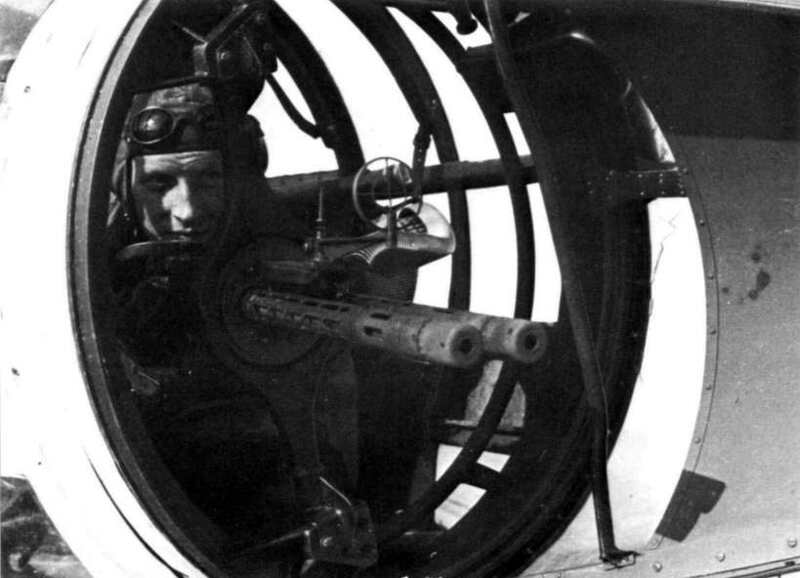 A NCO pilot adjusts the MG 81 on its flexible mount. 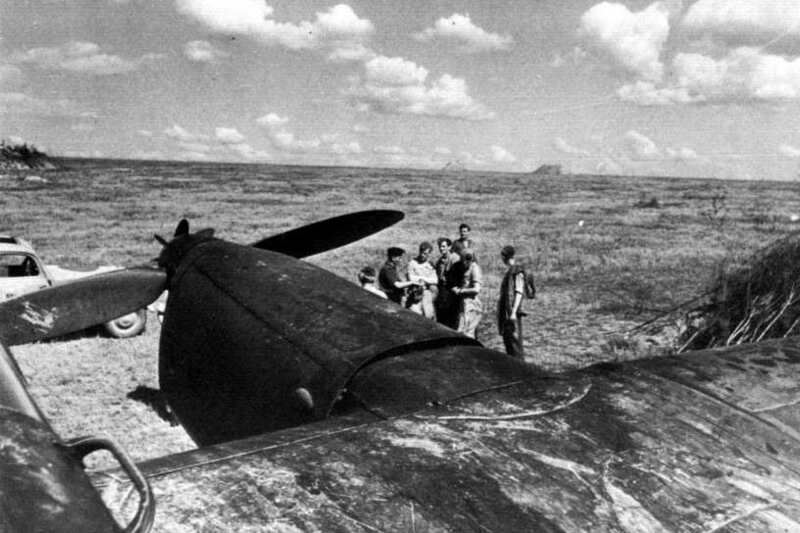 Visible in this photo is the rear view mirror which was sometimes the glider's only other means of defense. 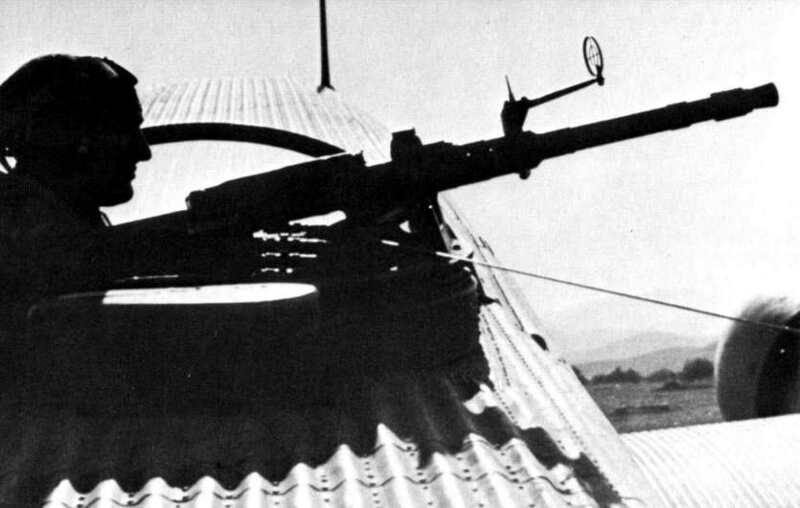 Often a forward firing MG 34 was mounted on brackets just below the canopy hinges. 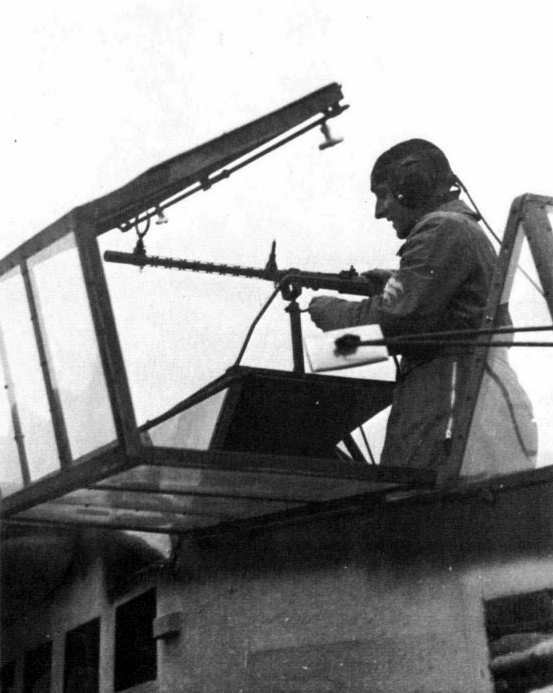 The gun was fed from a belt from within the canopy, and fired by means of a wire attached to the trigger, running into the canopy. 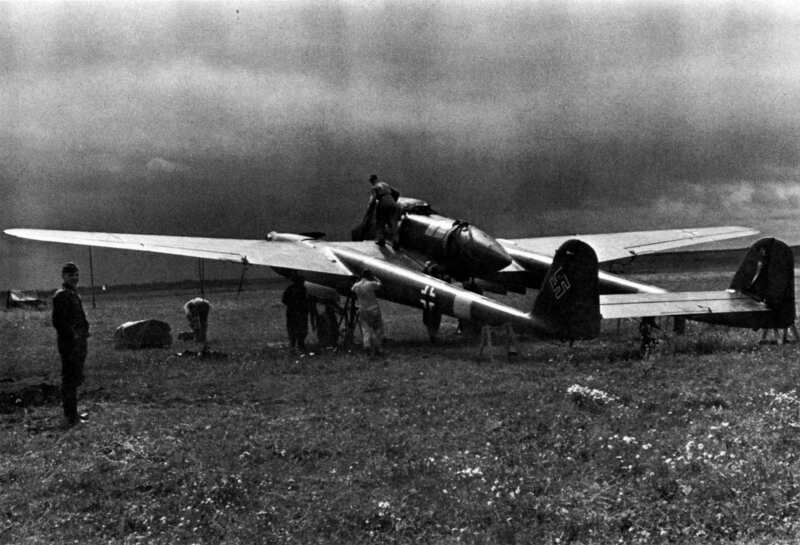 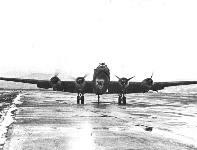 DFS 230As on an airfield in Southern Italy. 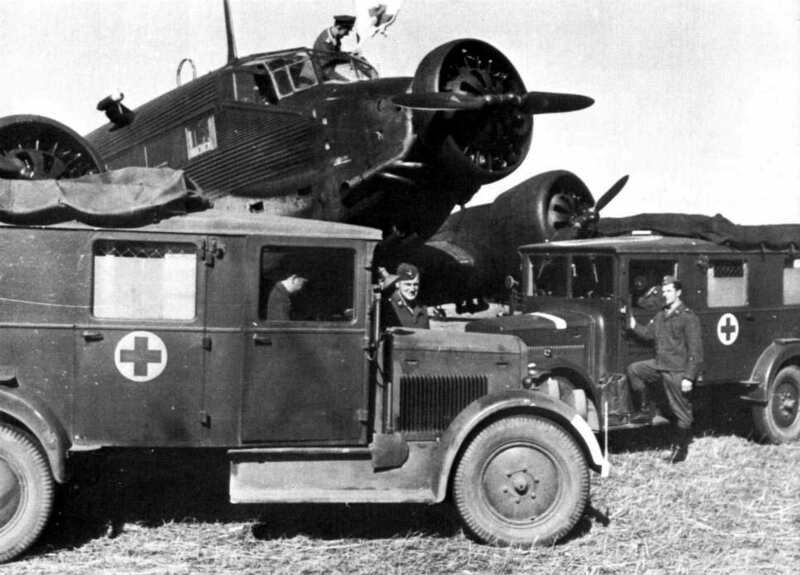 These gliders were used in North Africa for carrying supplies and evacuating personnel to Italy. 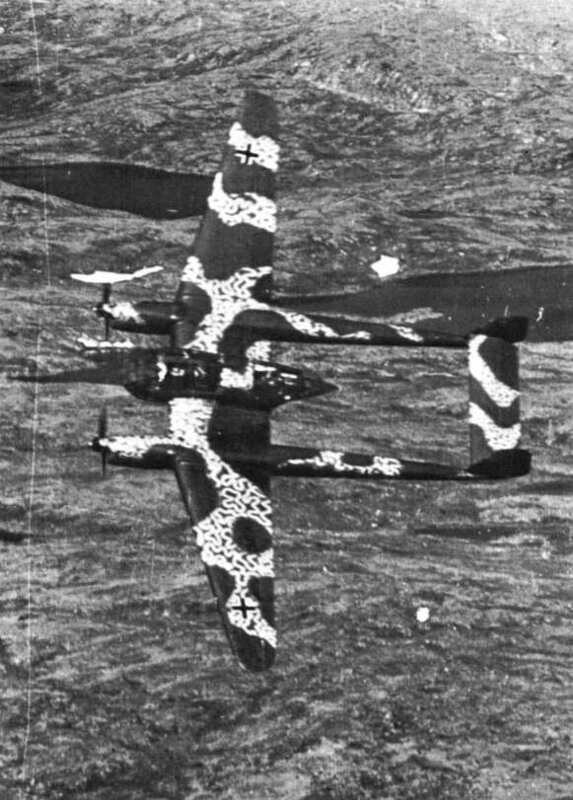 They feature a camouflage of grey 75 uppersurfaces, RLM Grey 02 undersurfaces and fuselage sides and grey 74 mottling on the fuselage. 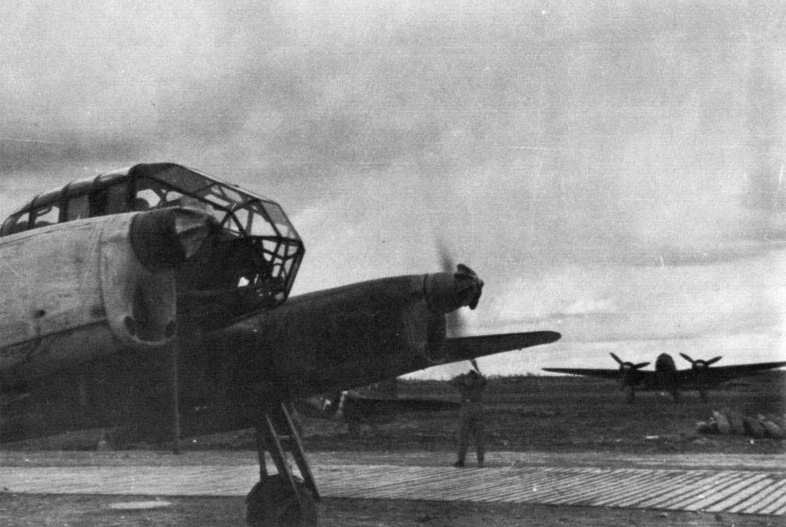 Aircraft in the photo are coded LB+194, LB+192 and LB+196. 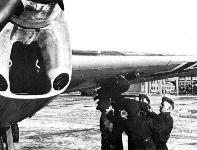 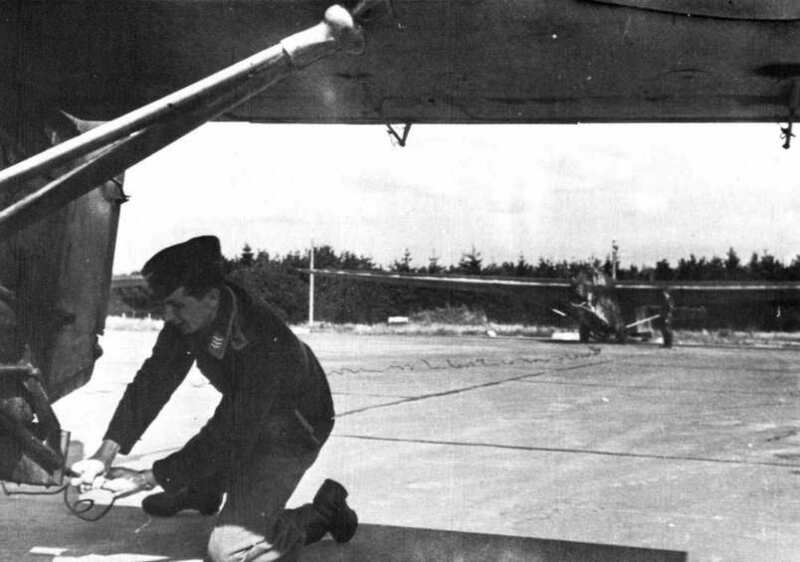 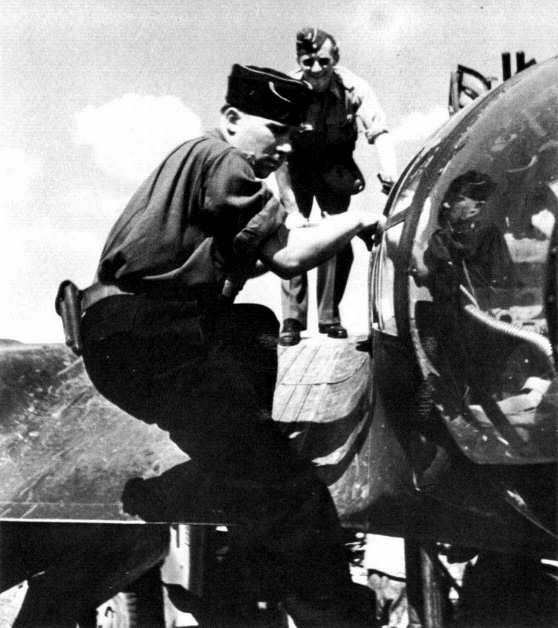 One the "men in black", a Luftwaffe ground crewman, attaches the tow cable with its release mechanism to the nose of a DFS 230A assault glider. 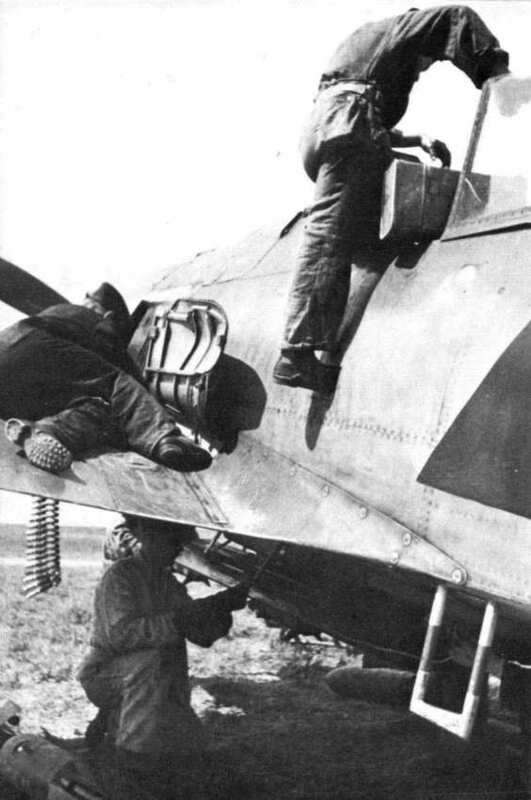 This aircraft is obviously fitted with forward firing machine gun brackets. 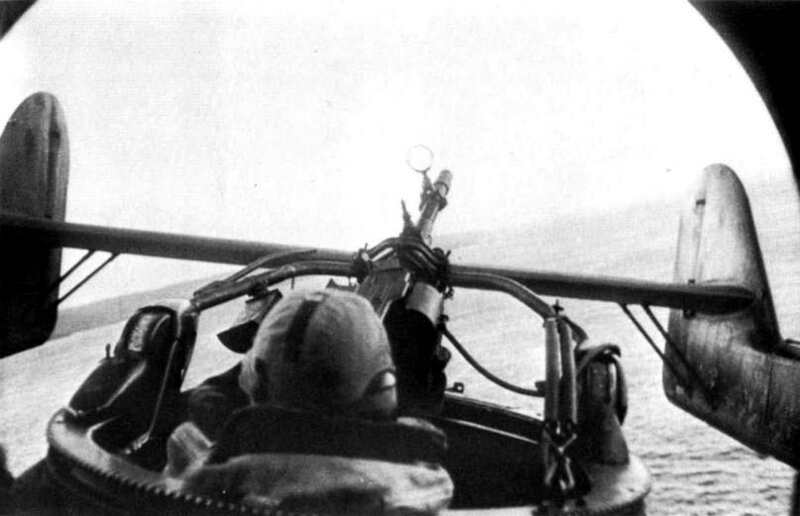 If not, the function of the ring sight in front of the windshield escapes this writer. 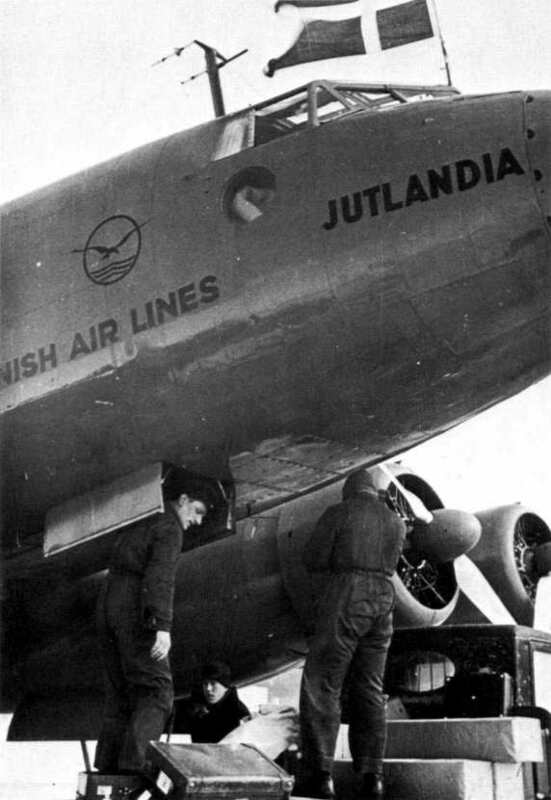 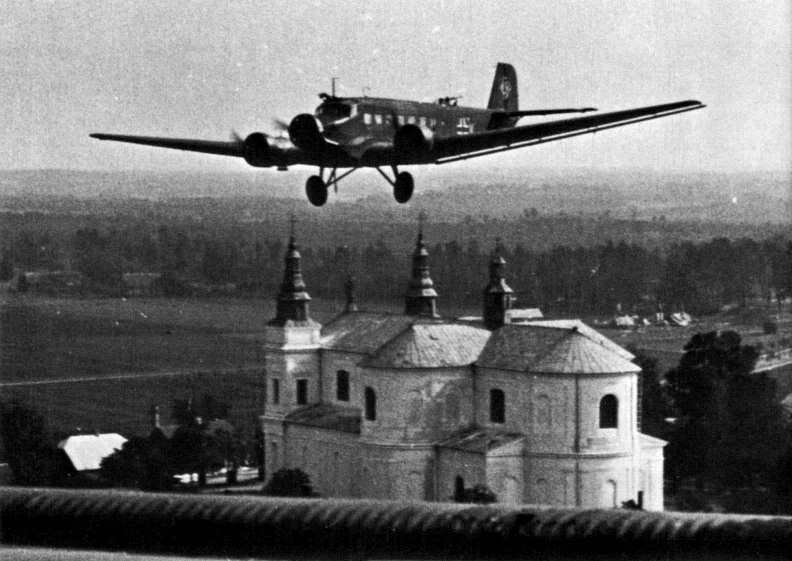 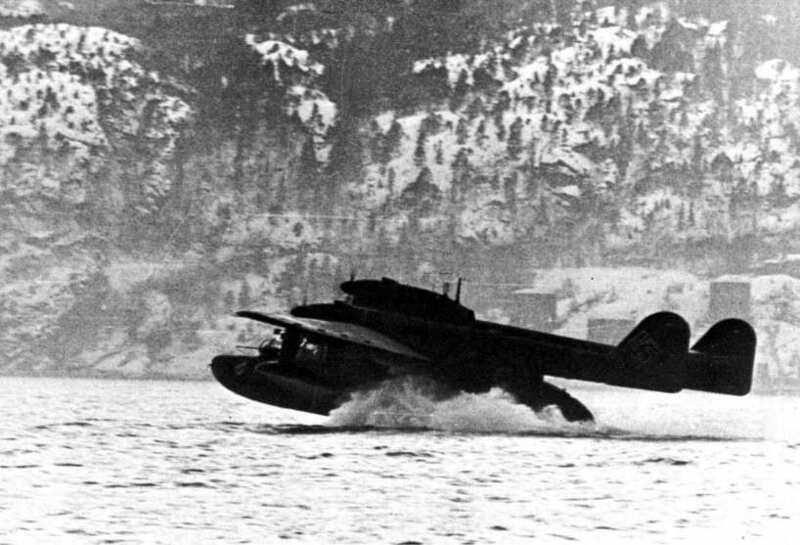 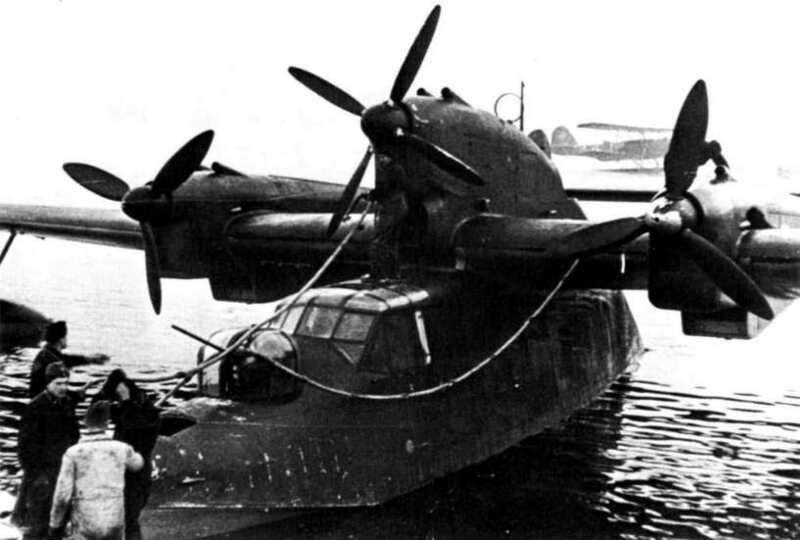 The "Jutlandia", the second FW 200A to be sold to the Danish State airlines, in November of 1938. 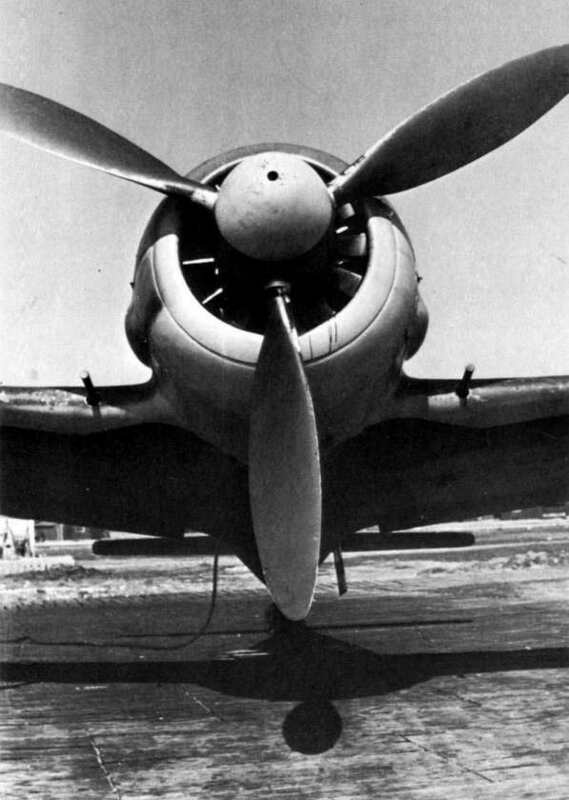 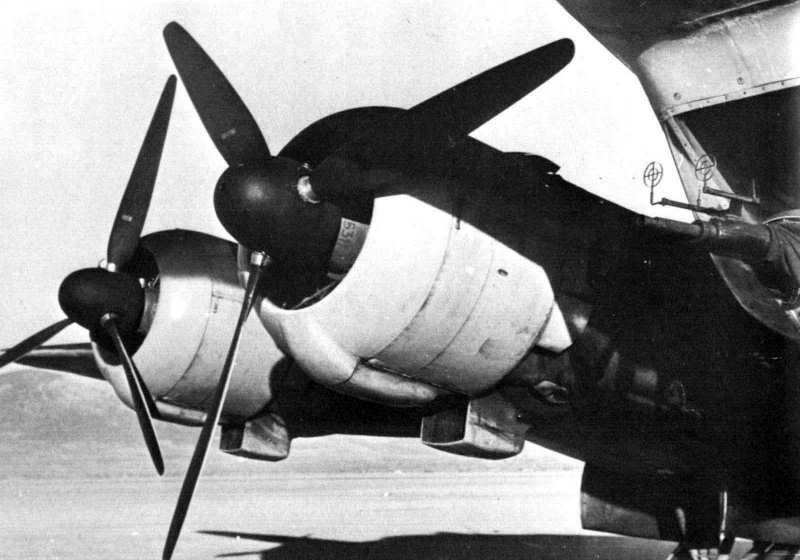 The aircraft featured 4 x 720 hp radial engines, each turning a fixed pitch Hamilton Standard two-bladed propeller. 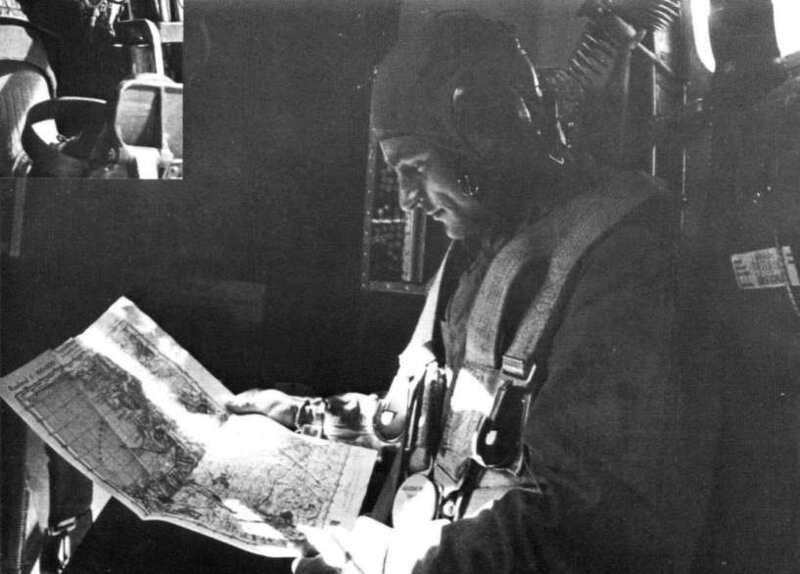 The navigator of a FW 200 surveys a map of the Norwegian coast. 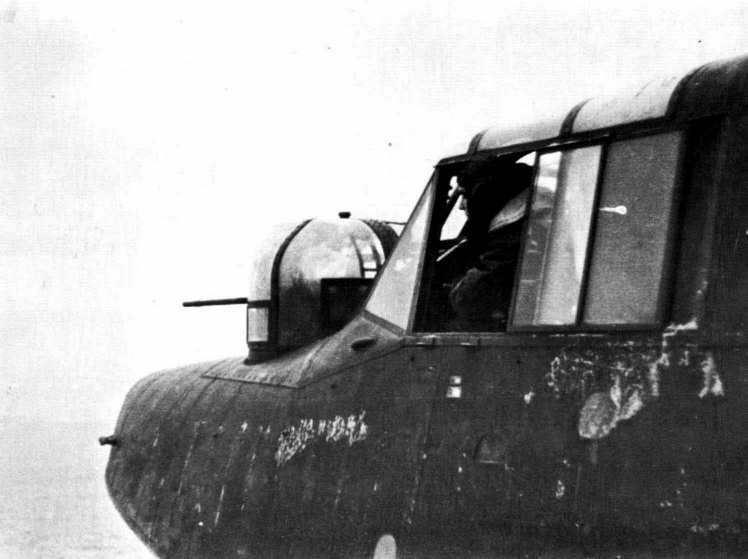 To the navigator's right may be seen the ammunition stowage box and the ammunition belt running to a MG 15 located in the fuselage window.